Since pub­li­ca­tion, we’ve learned that The Boom has requested a 2-weekend return engage­ment of The King of Queen in January . 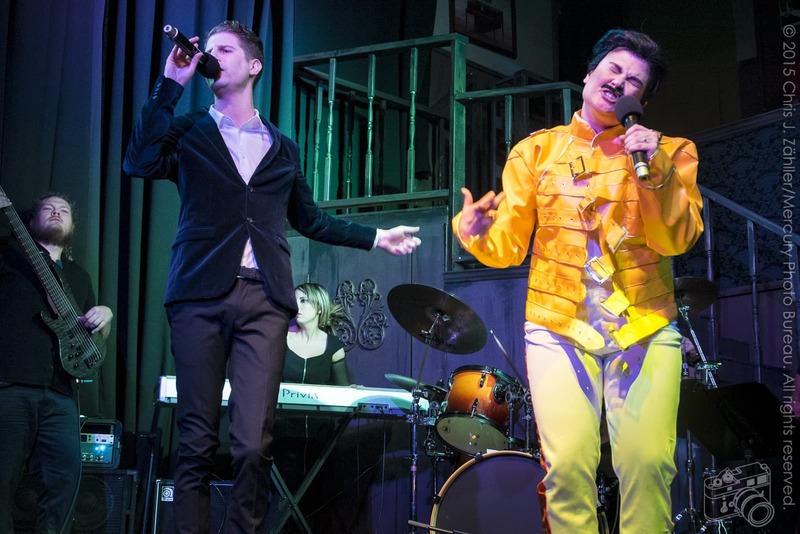 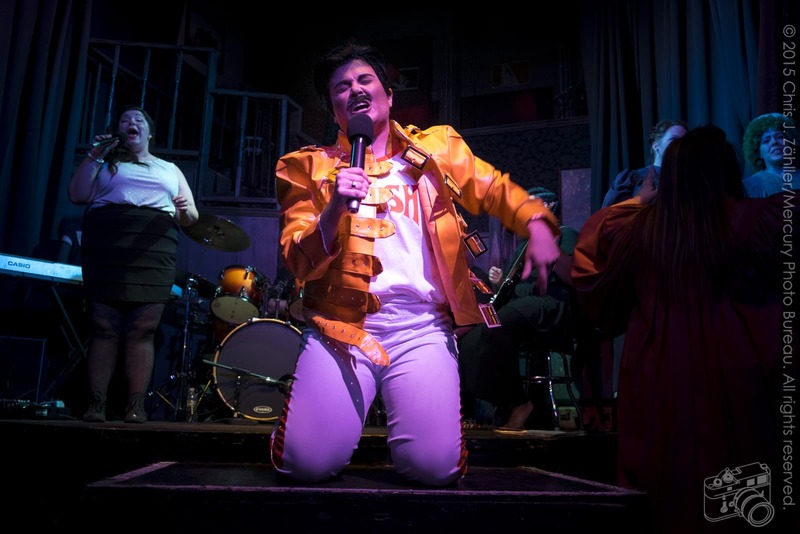 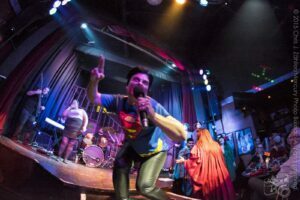 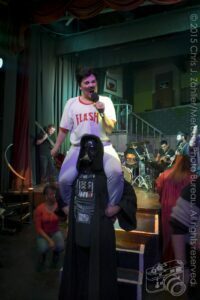 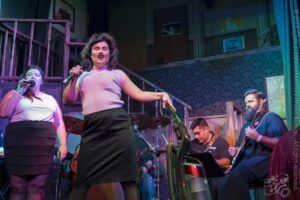 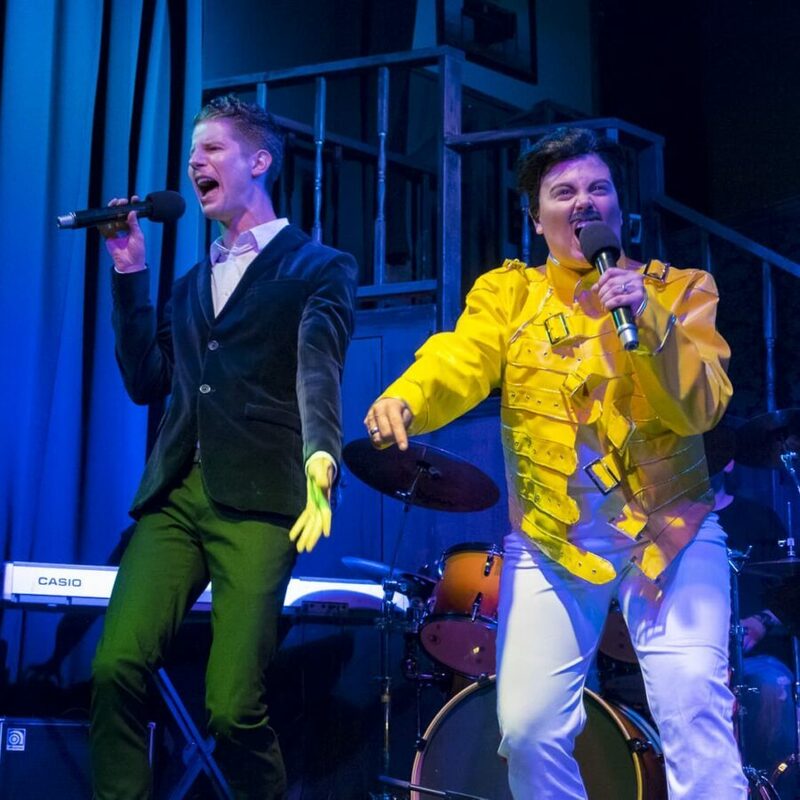 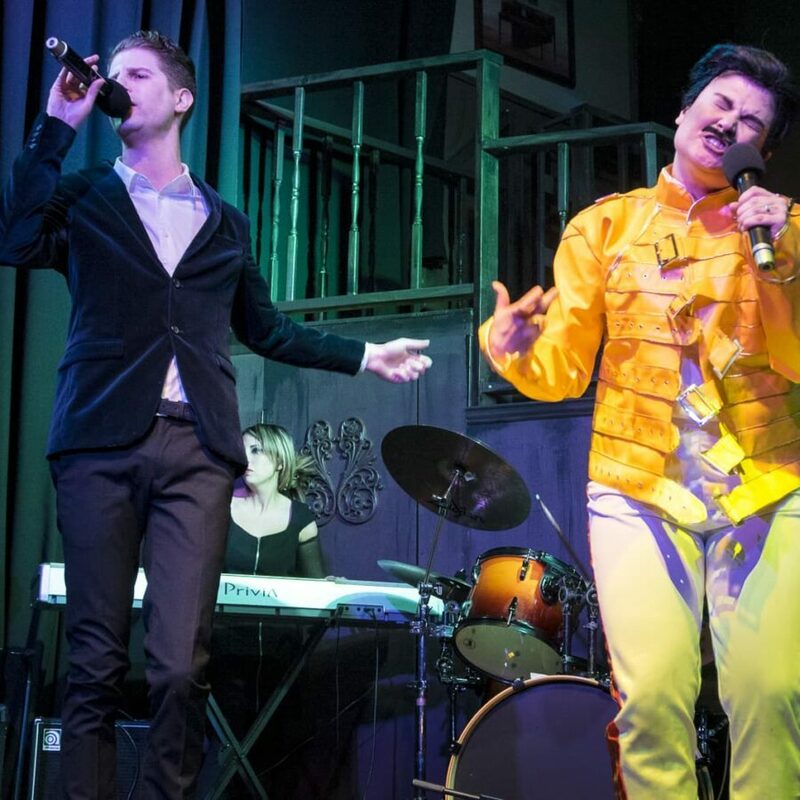 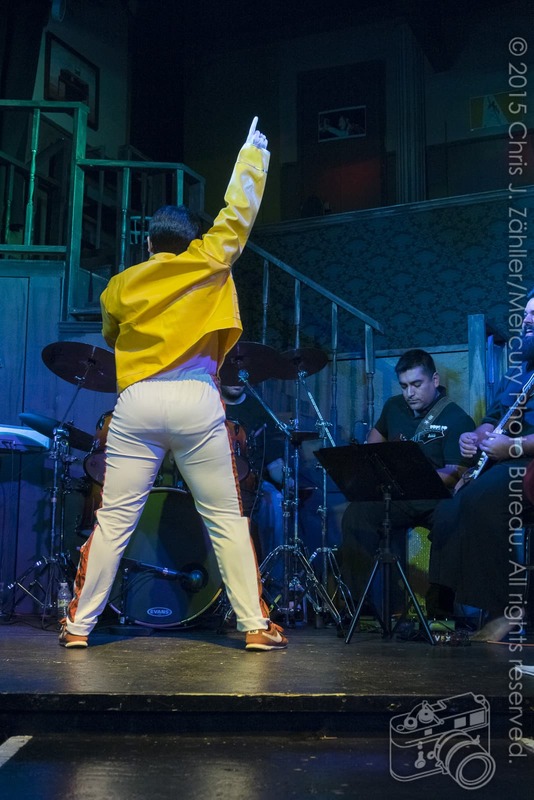 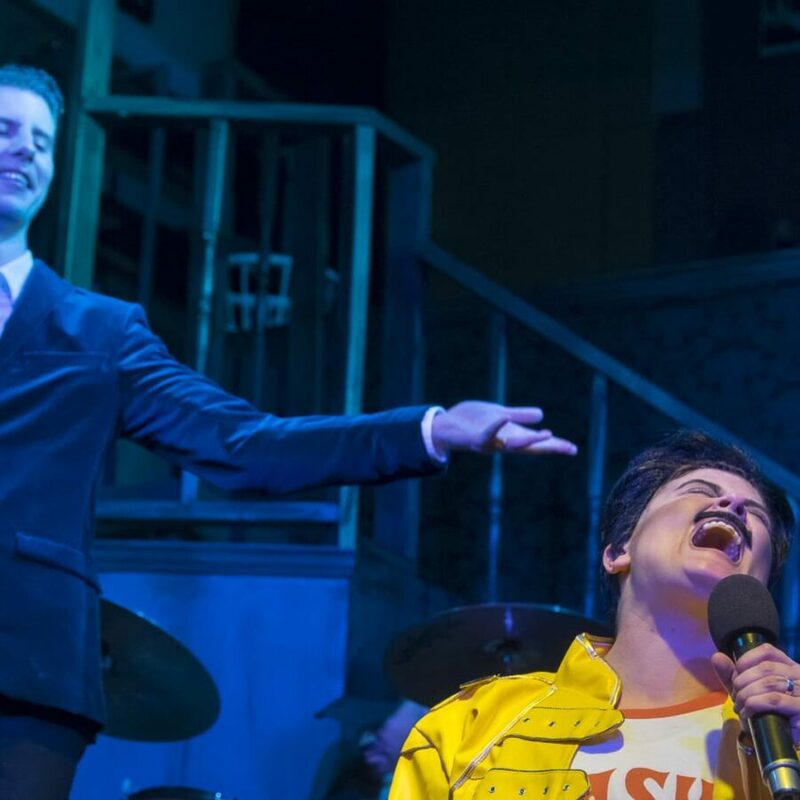 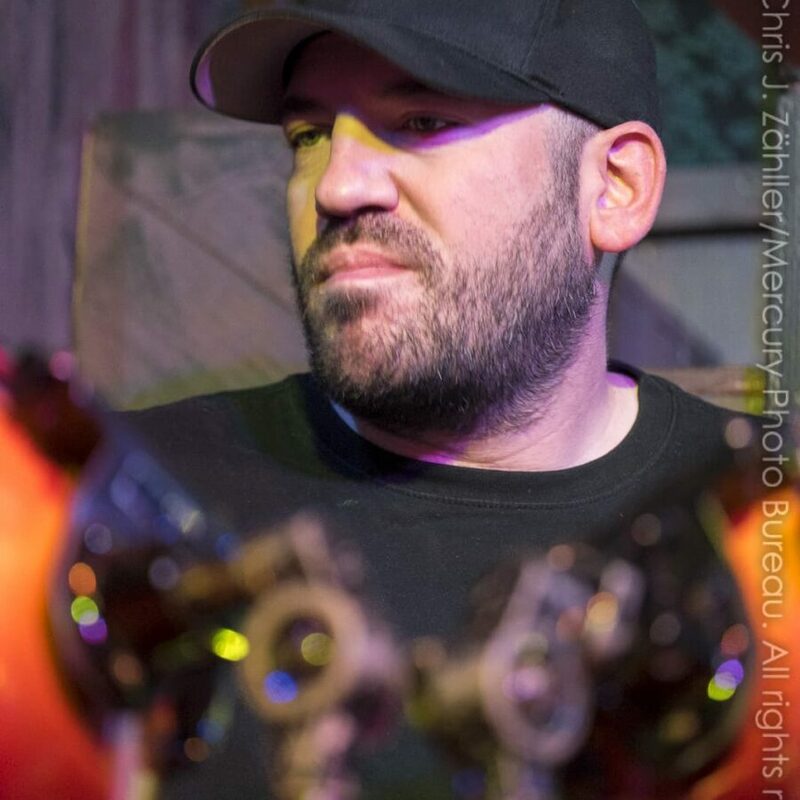 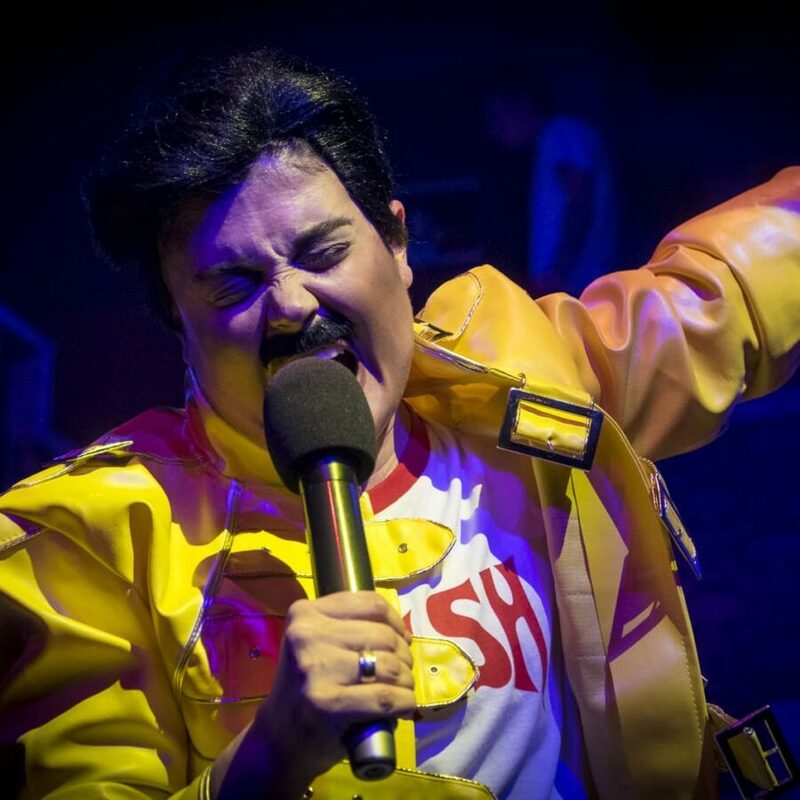 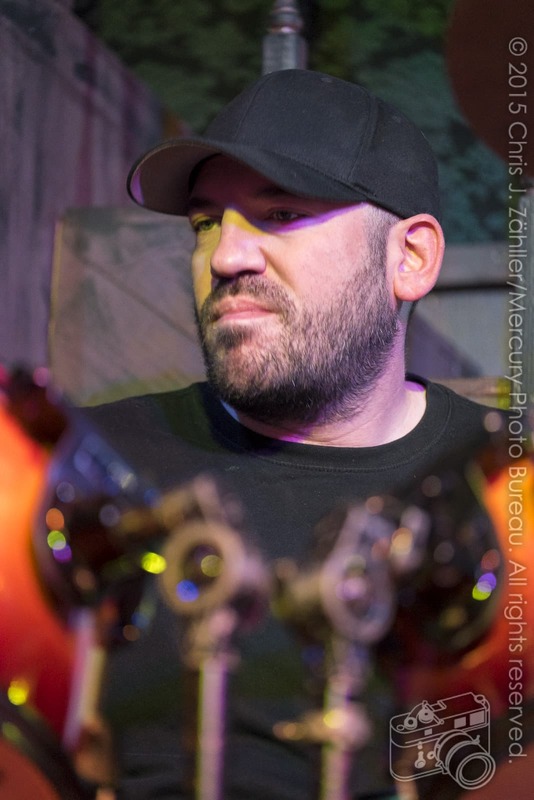 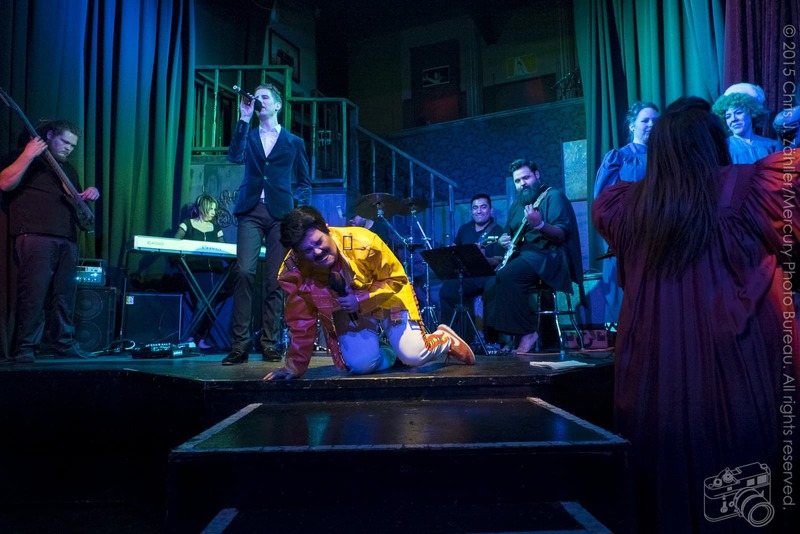 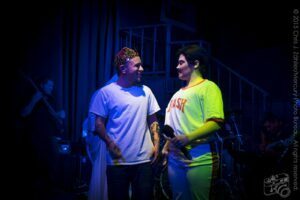 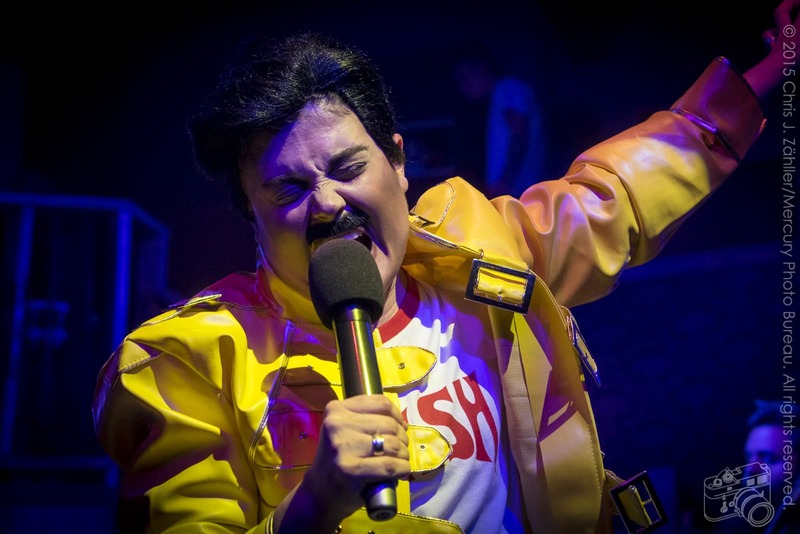 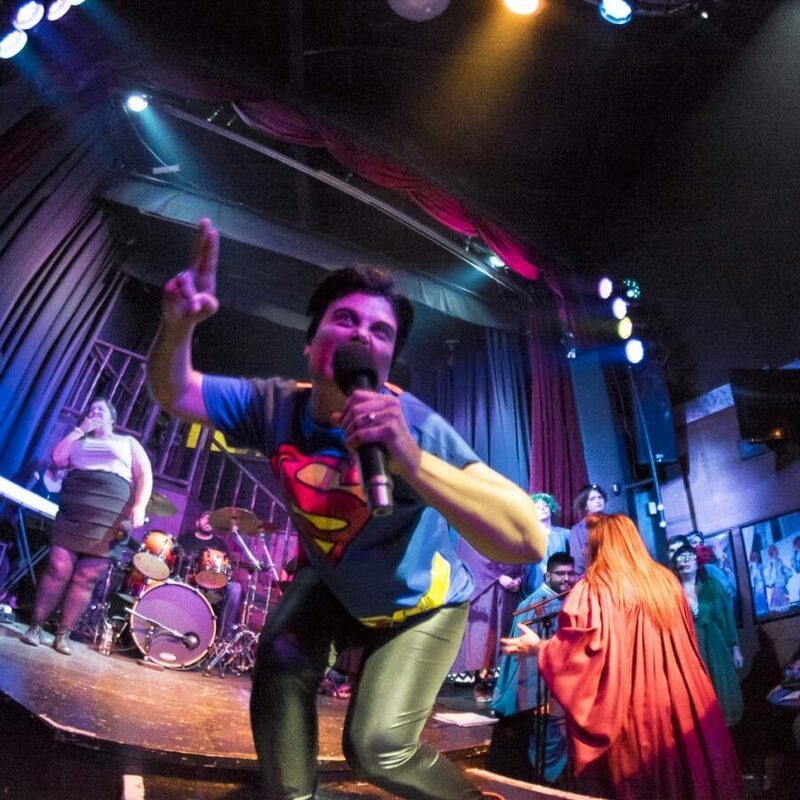 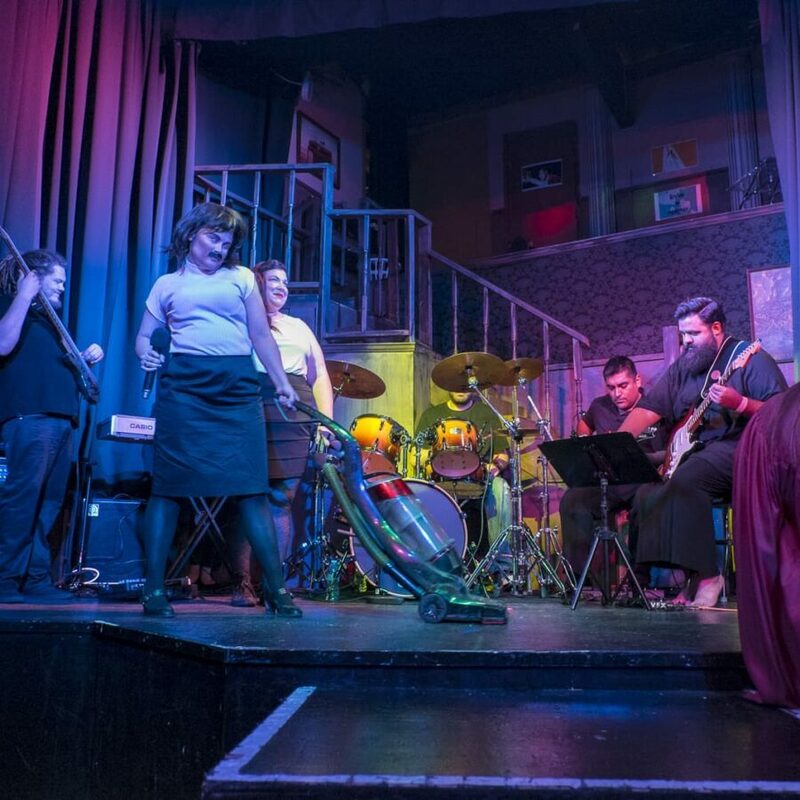 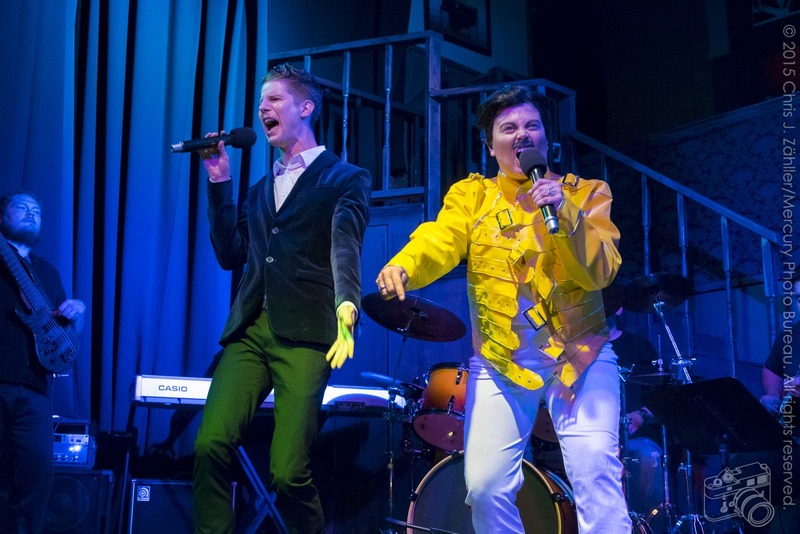 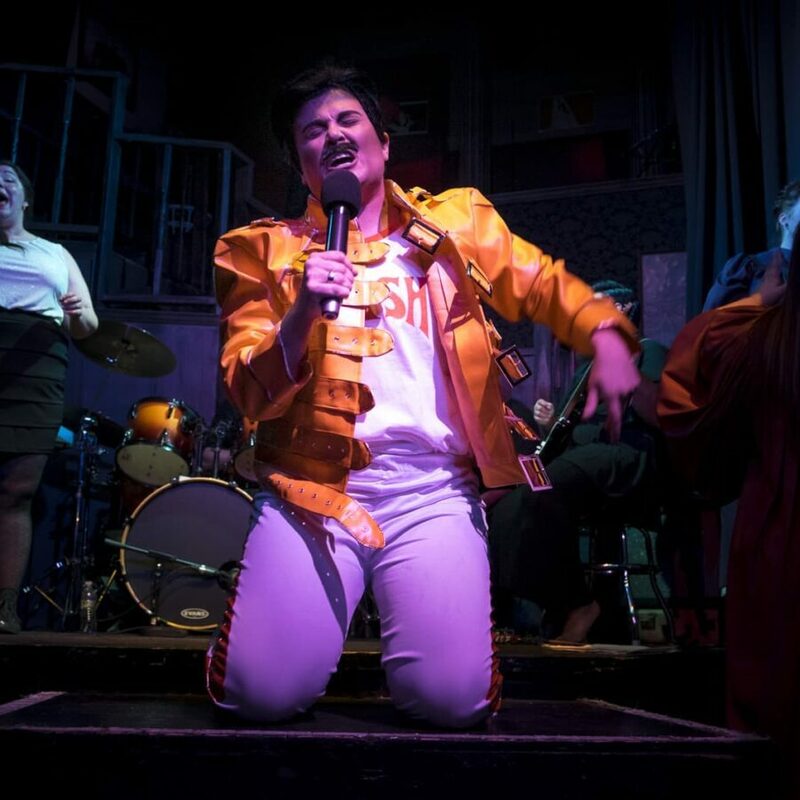 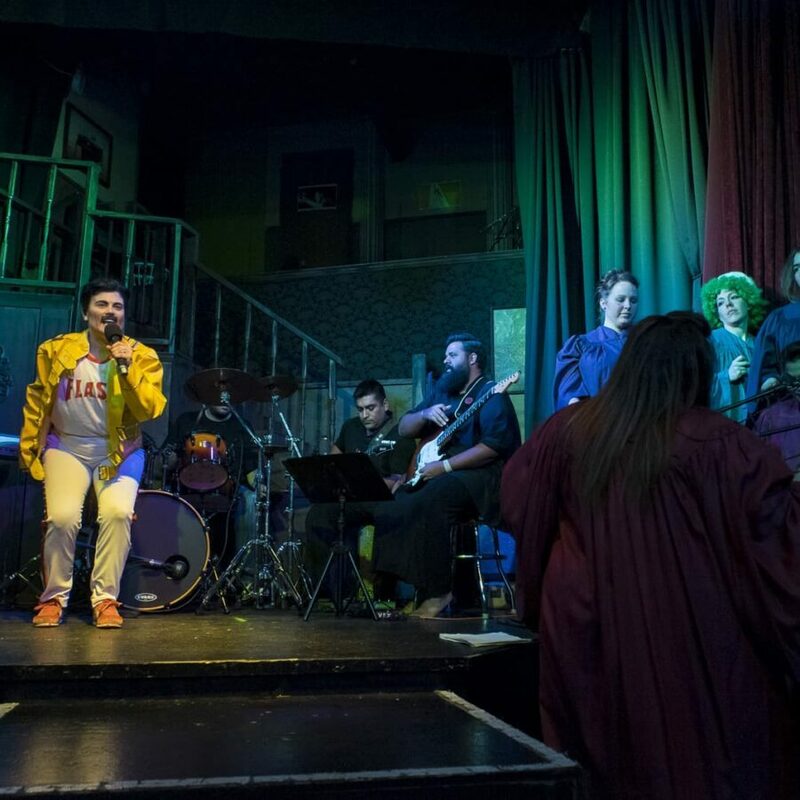 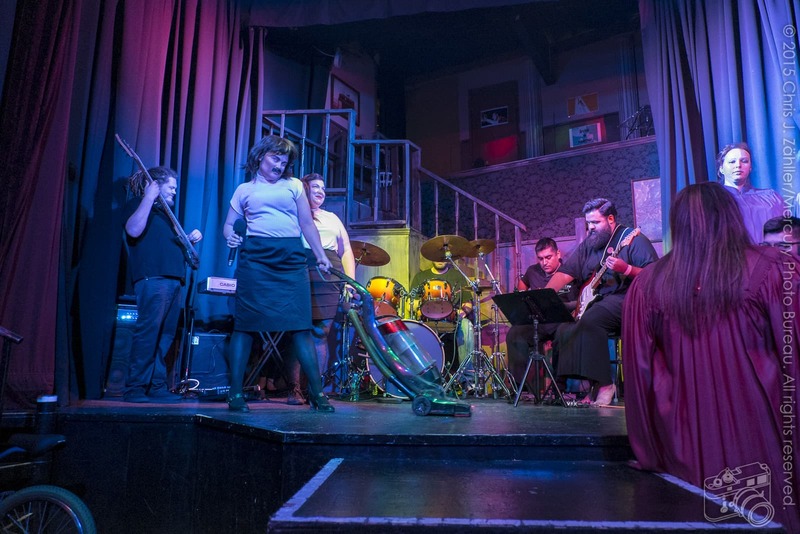 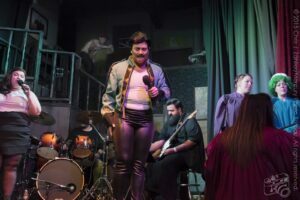 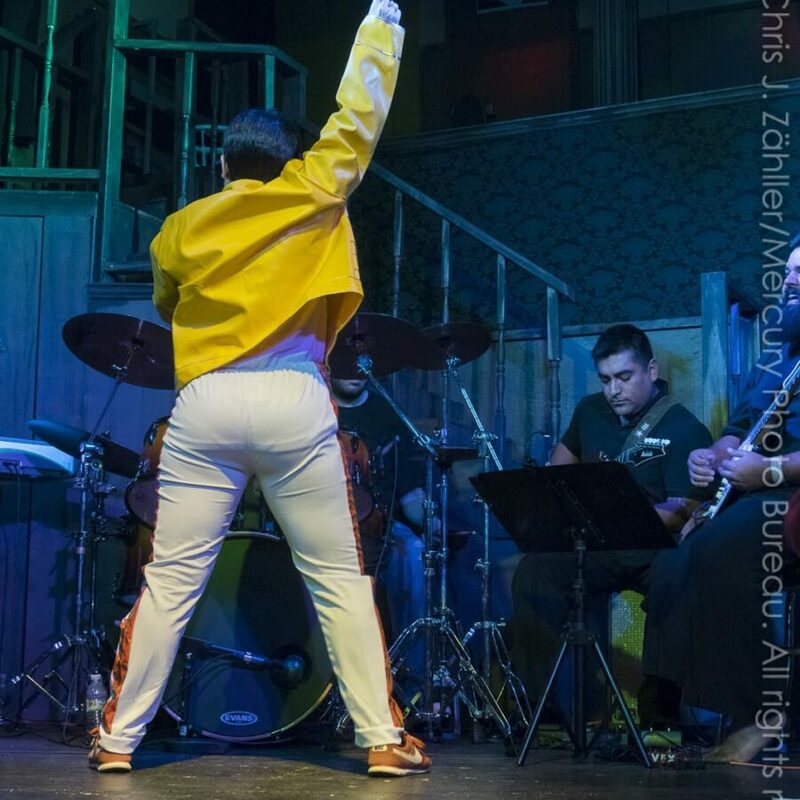 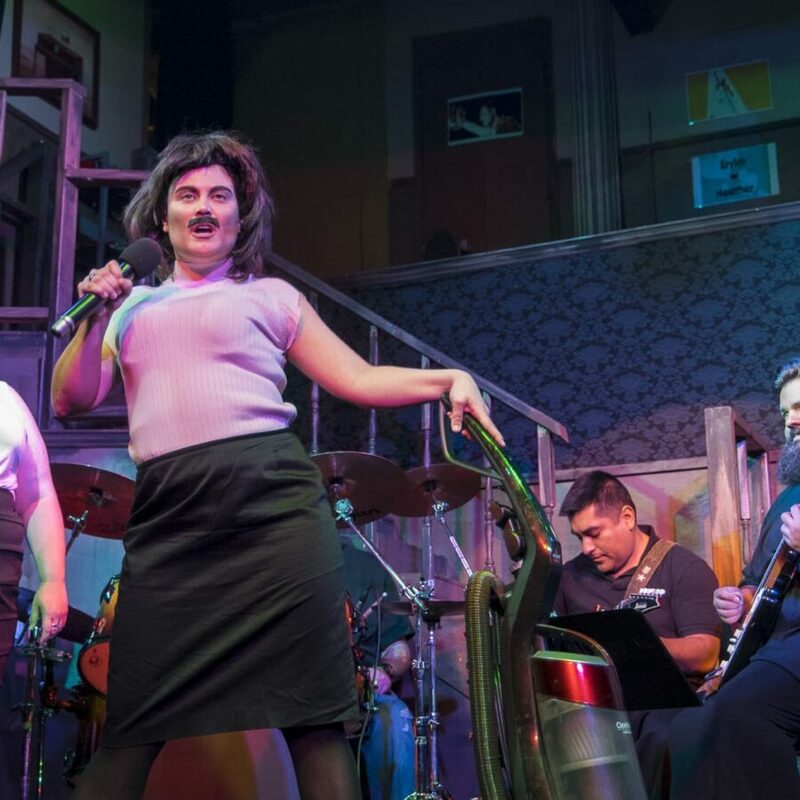 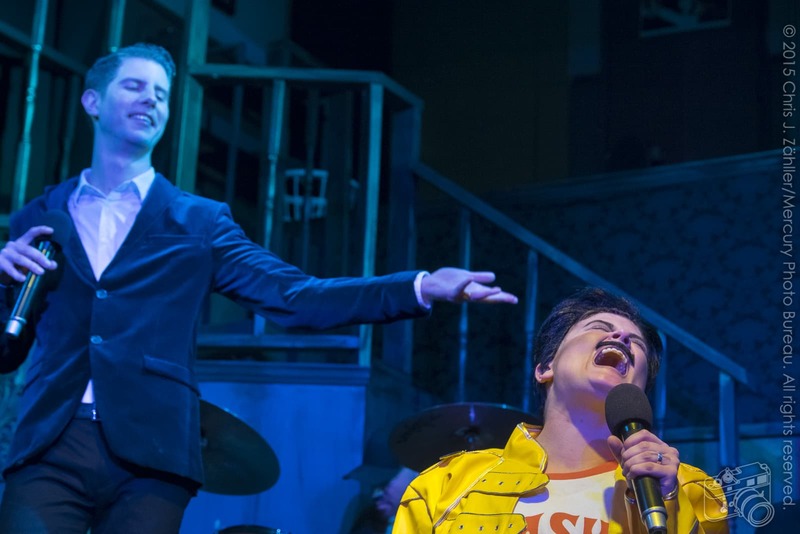 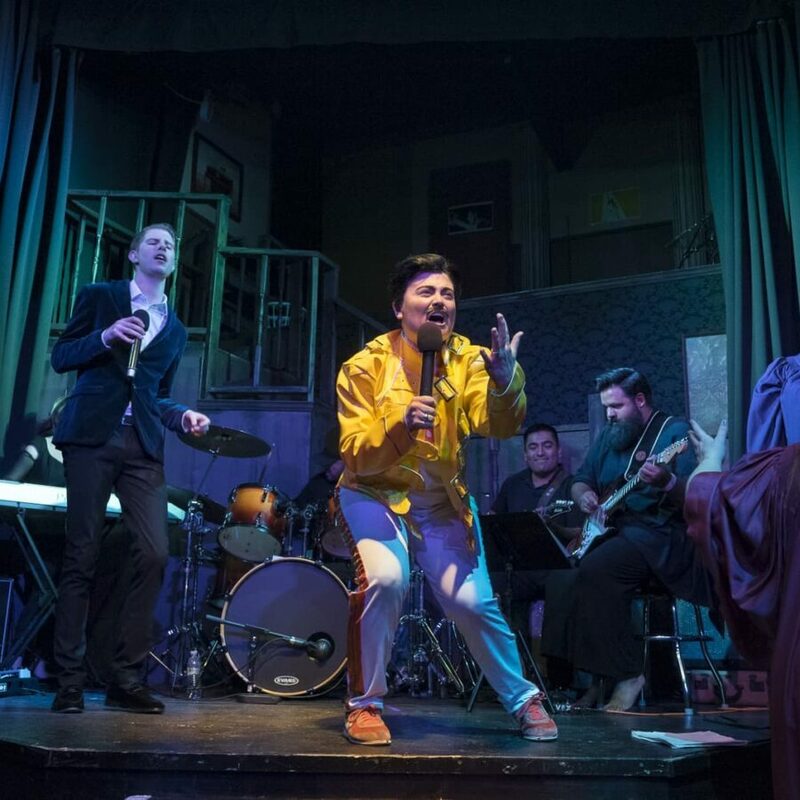 Featur­ing the music of the late Queen front­man Freddie Mercury, Friday and Saturday ’s per­for­mances of The King of Queen played to sold out houses at Oklahoma City gay bar and per­for­mance venue, The Boom. 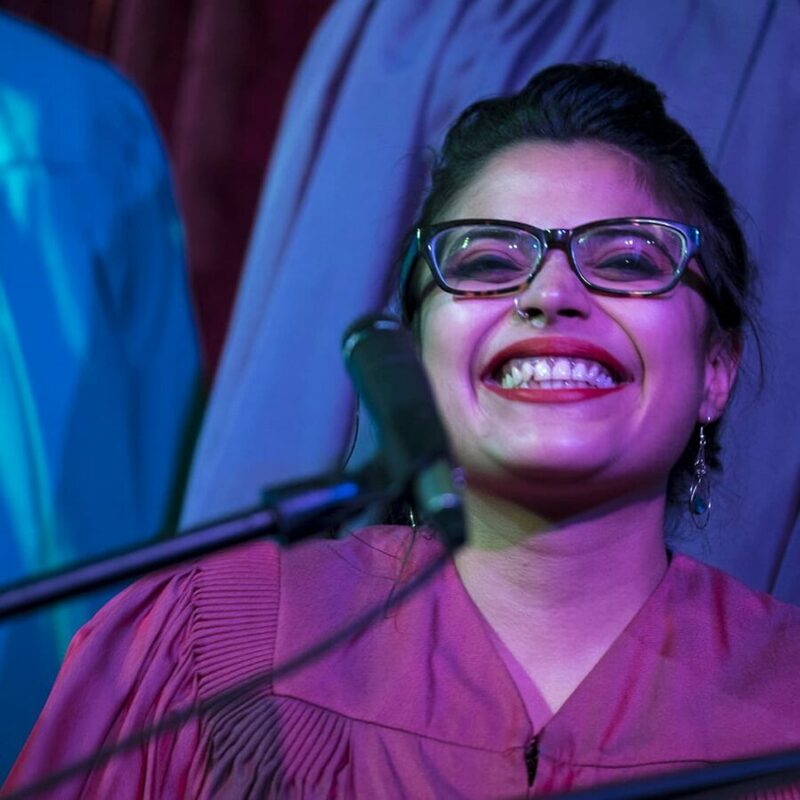 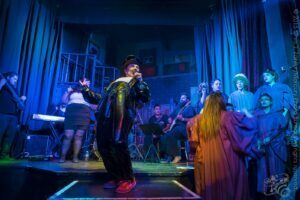 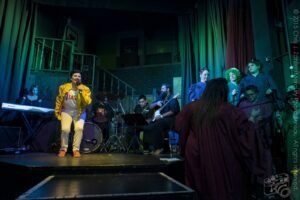 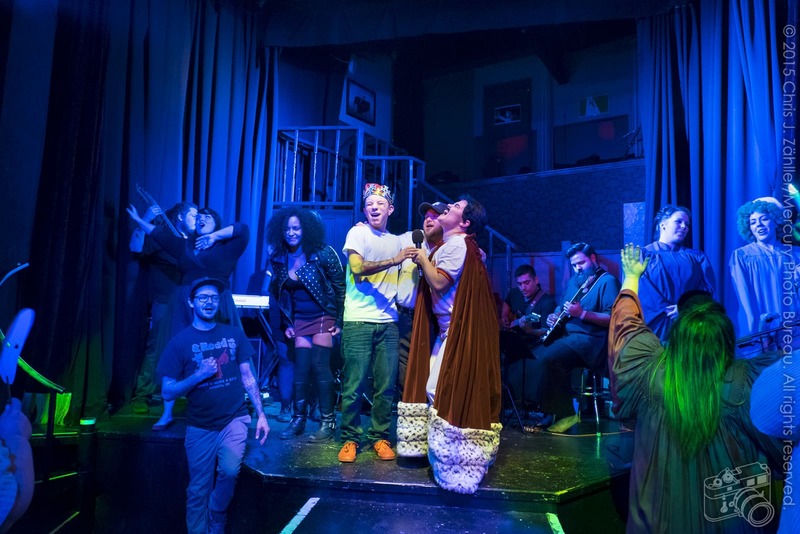 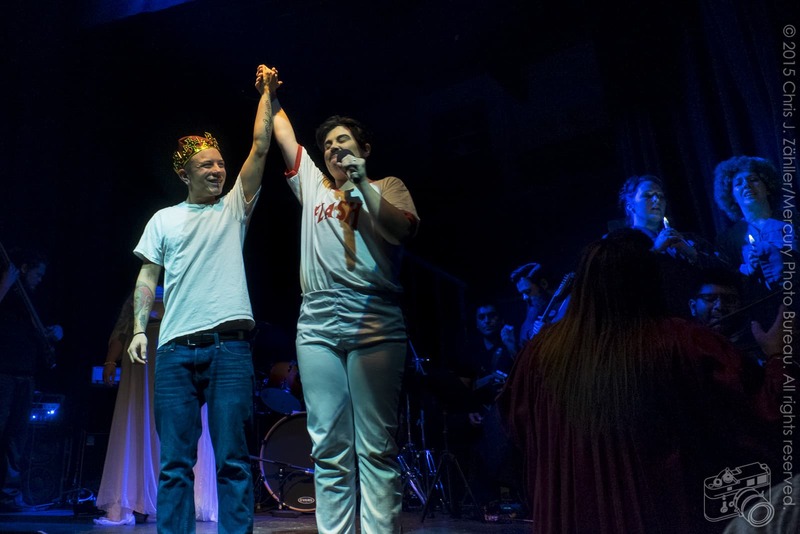 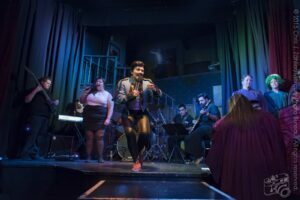 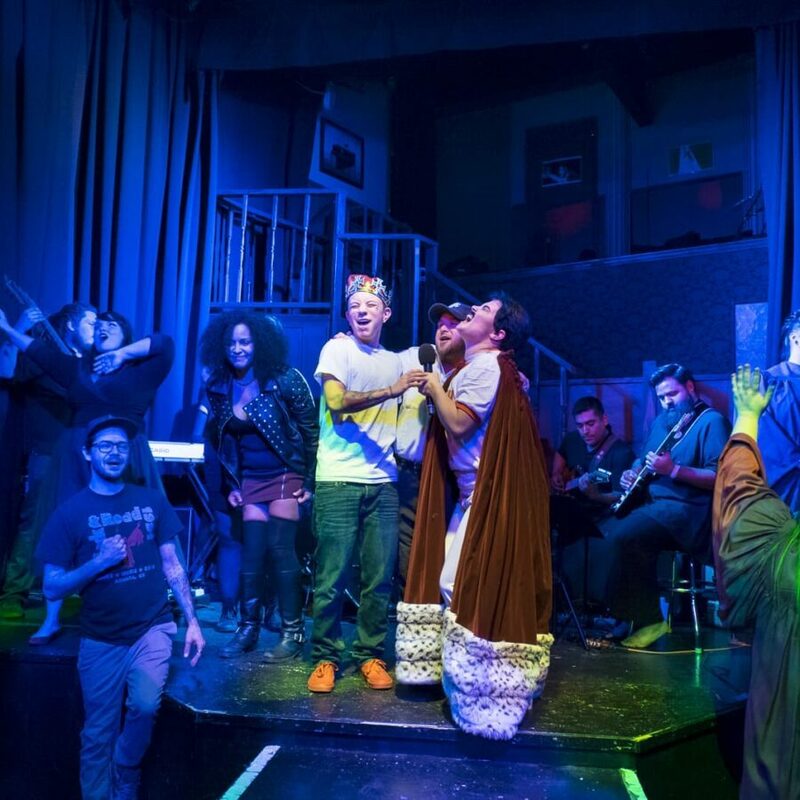 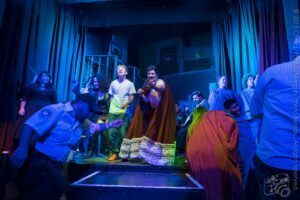 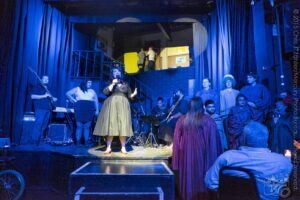 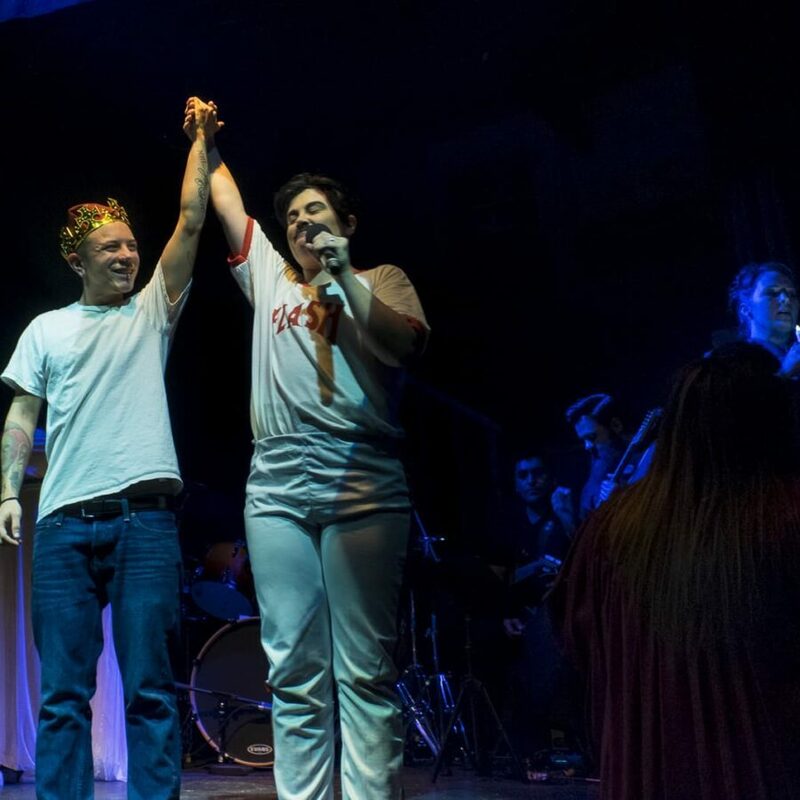 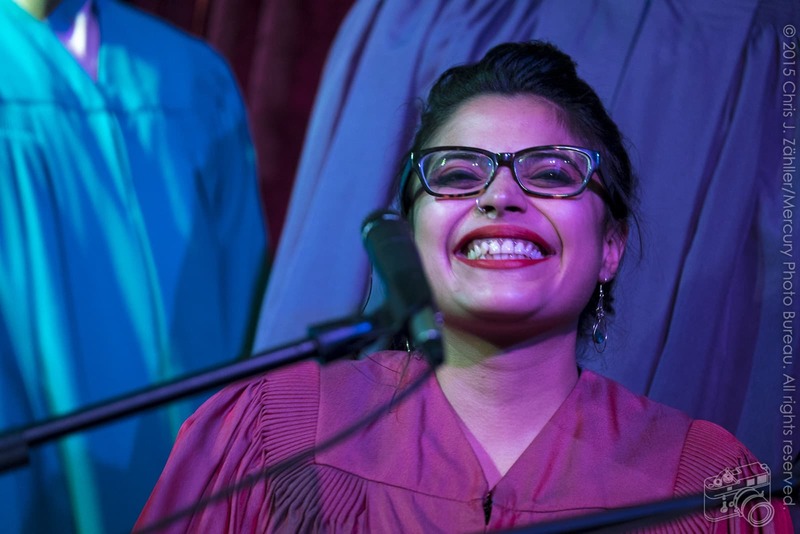 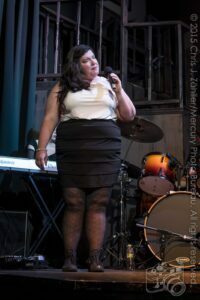 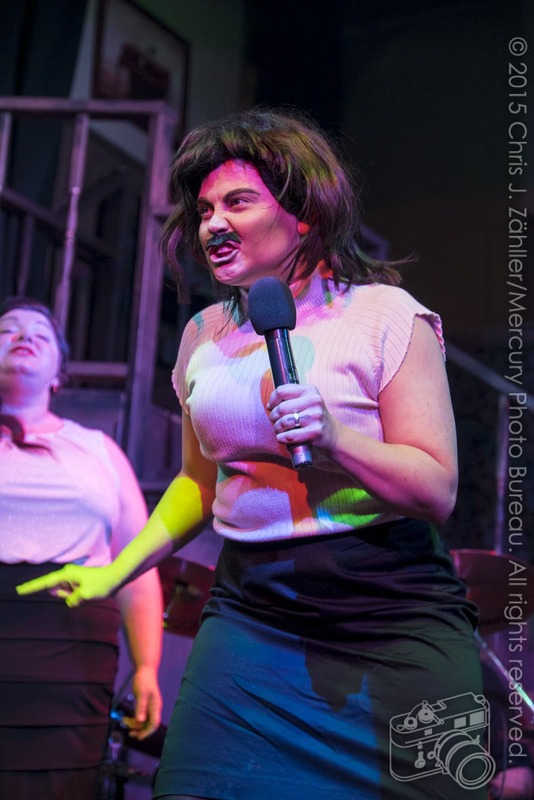 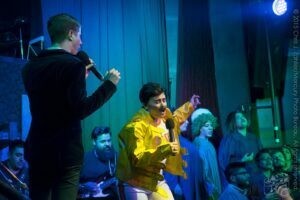 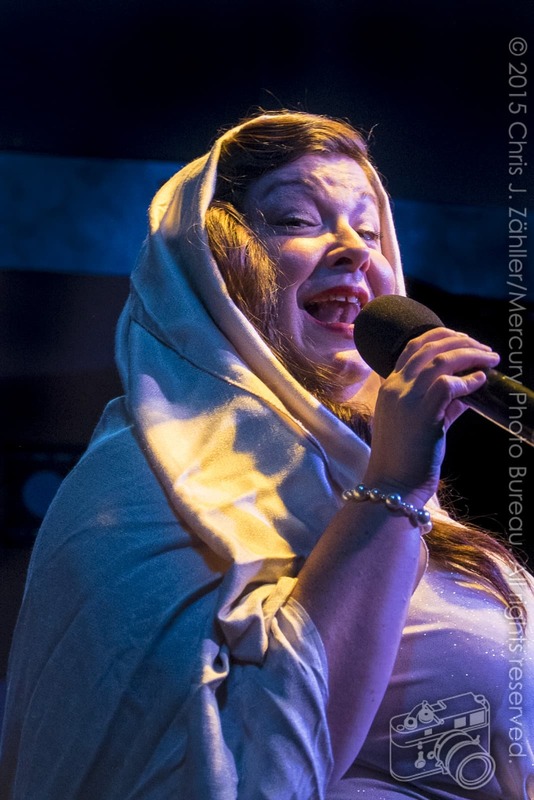 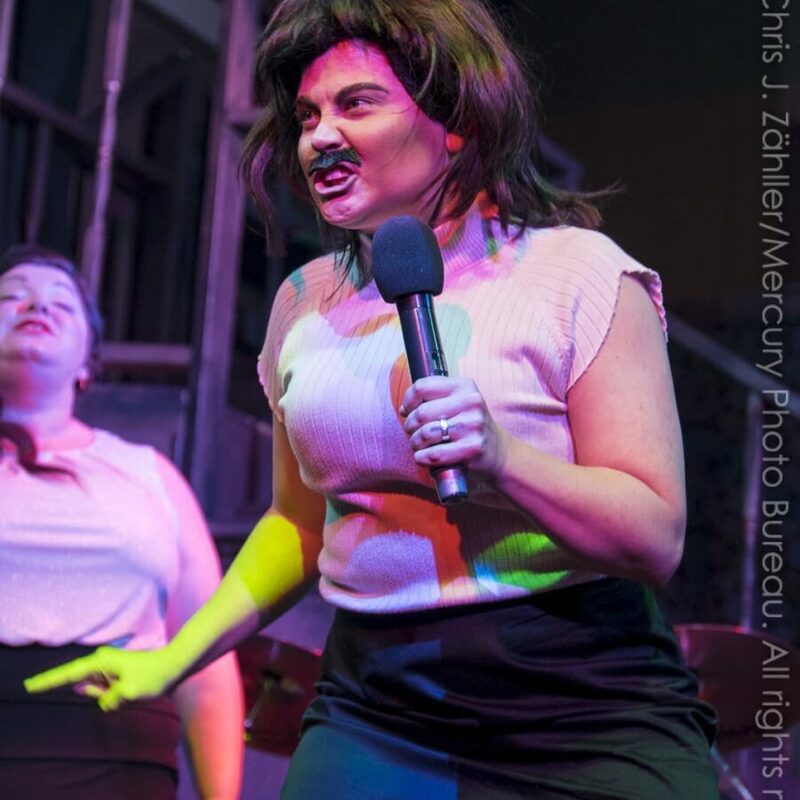 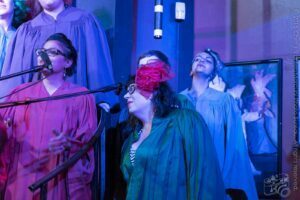 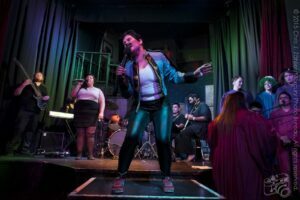 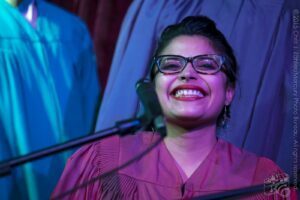 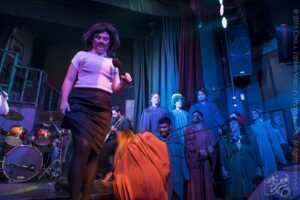 The audi­ence were treated to a live band, 8-member choir, and a high energy per­for­mance by director-producer Leslie Hensley, who plays Mercury, in col­lab­o­ra­tion with inter­na­tion­ally tour­ing poet and activist Lauren Zuniga. 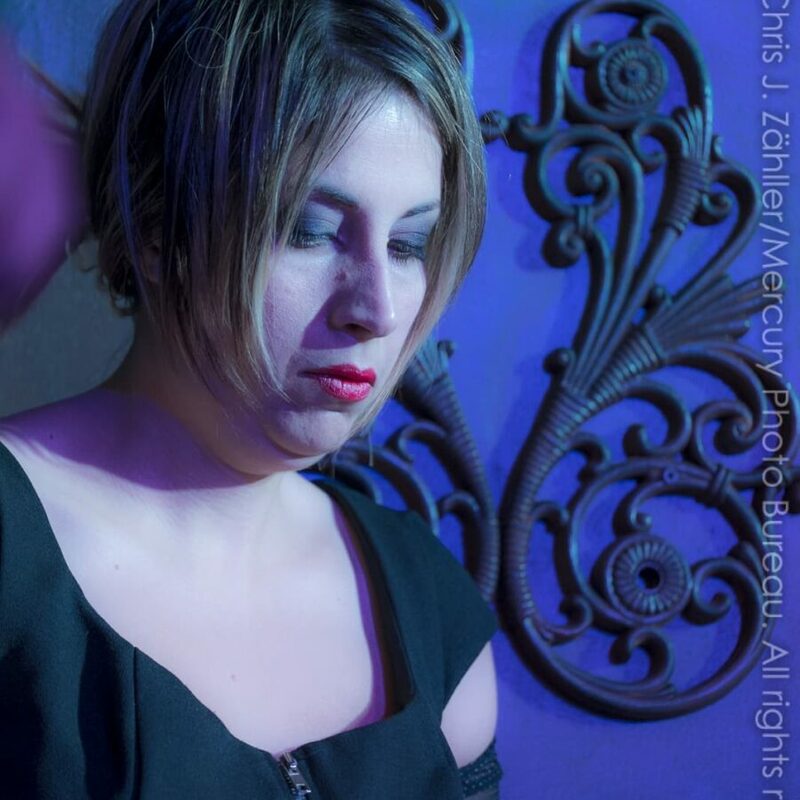 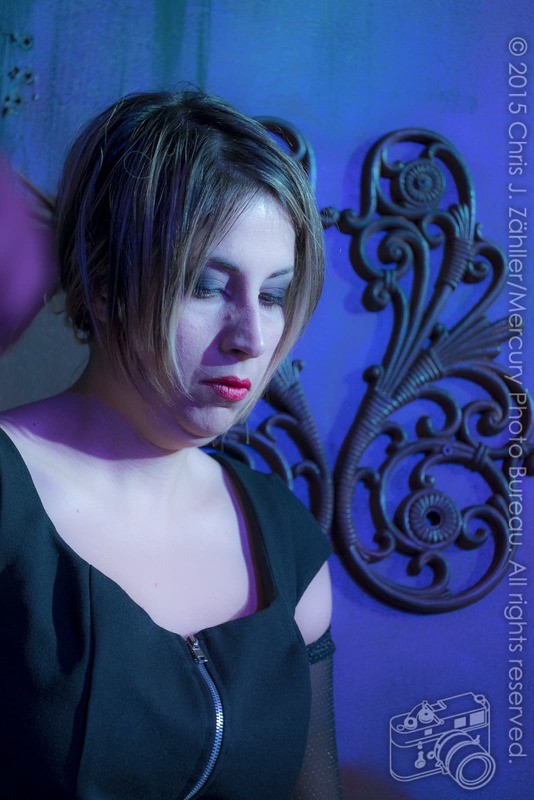 This year I wanted to do a show that was not only enter­tain­ing but also had a mes­sage. Freddie is the ulti­mate hero. When I was a kid I just wanted to jump around and be in that band. 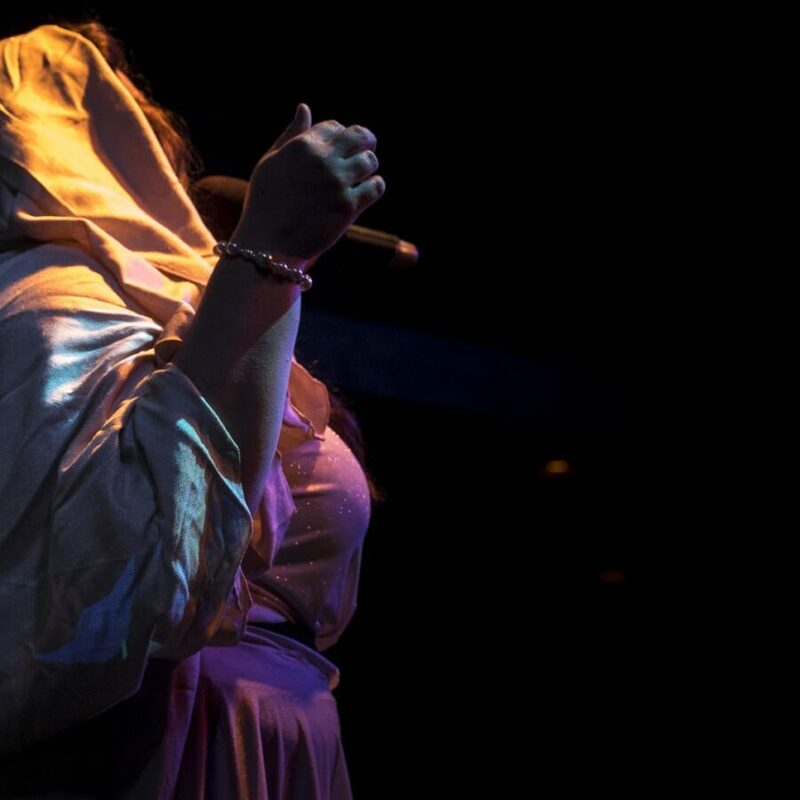 Every inner dia­logue can be nar­rated by a Queen song. 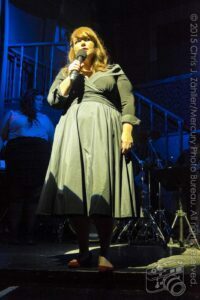 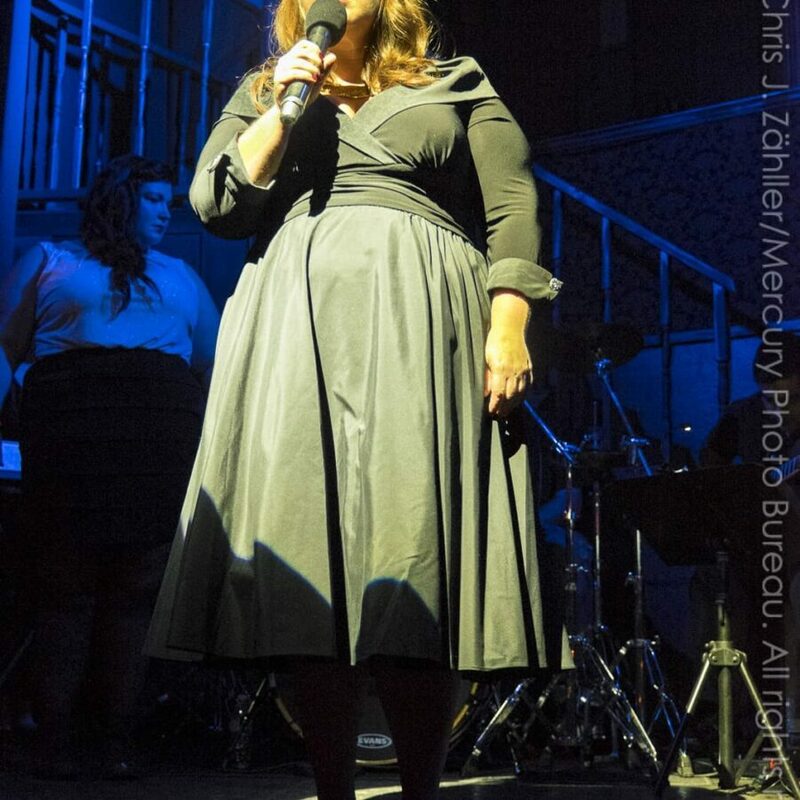 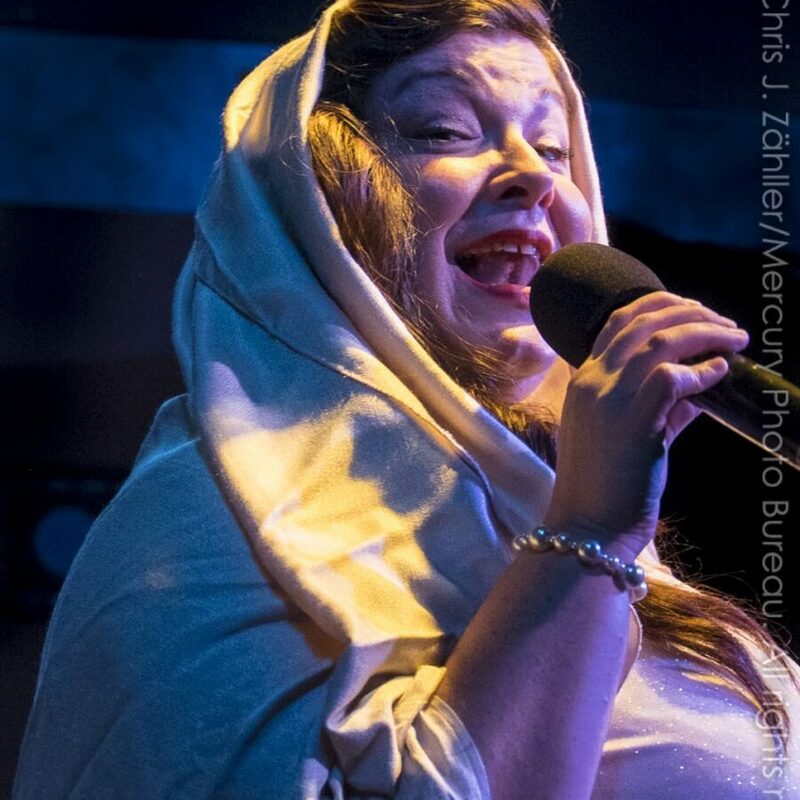 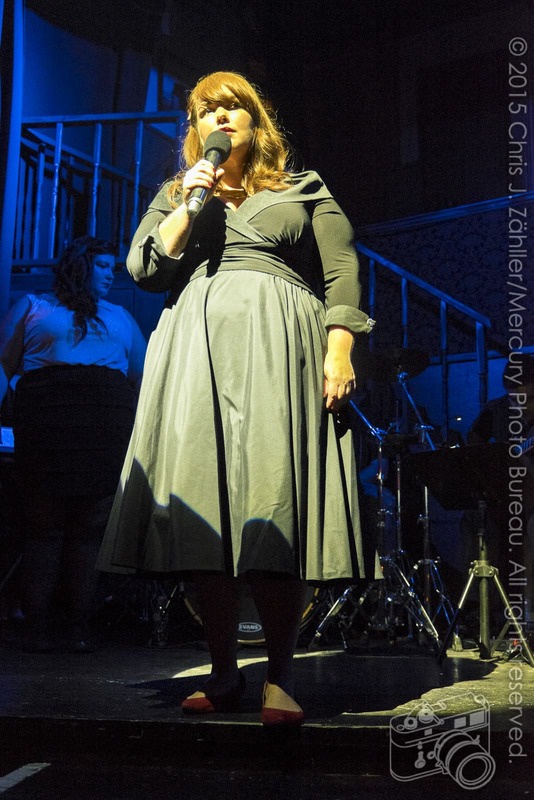 Hensley, known by her stage name Balthazar, chose the songs to fit the libretto by Zuniga. 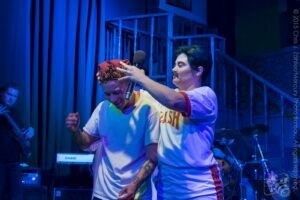 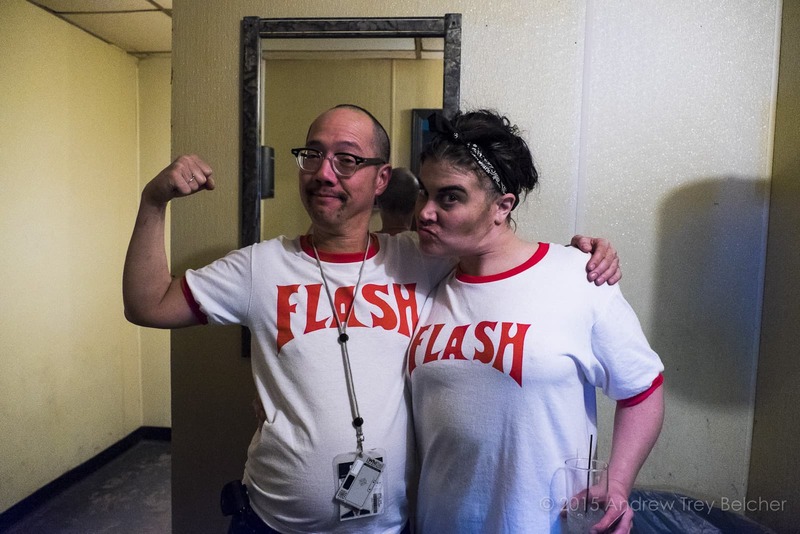 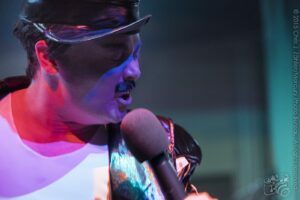 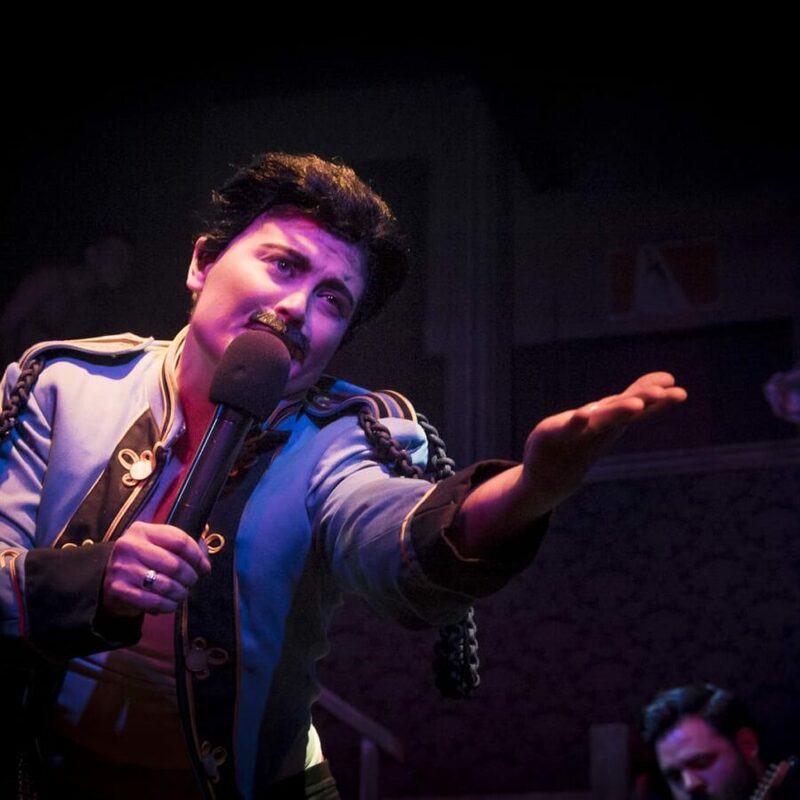 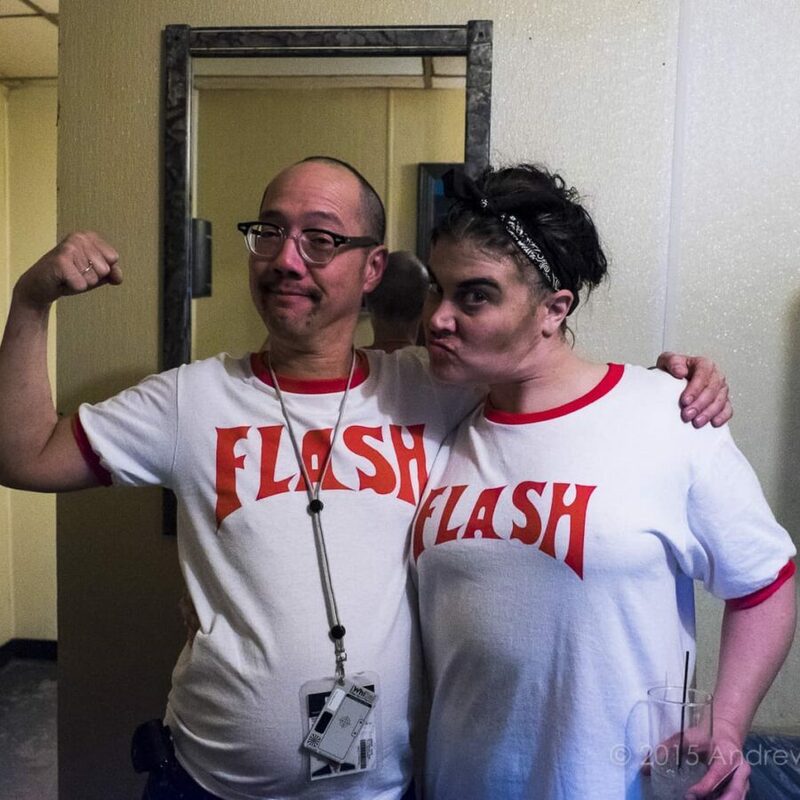 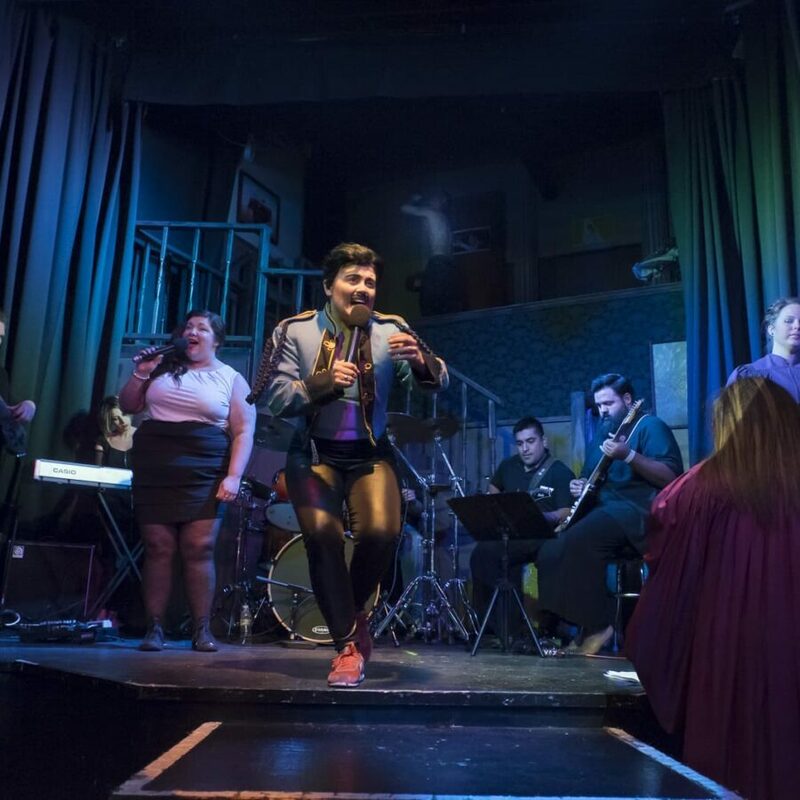 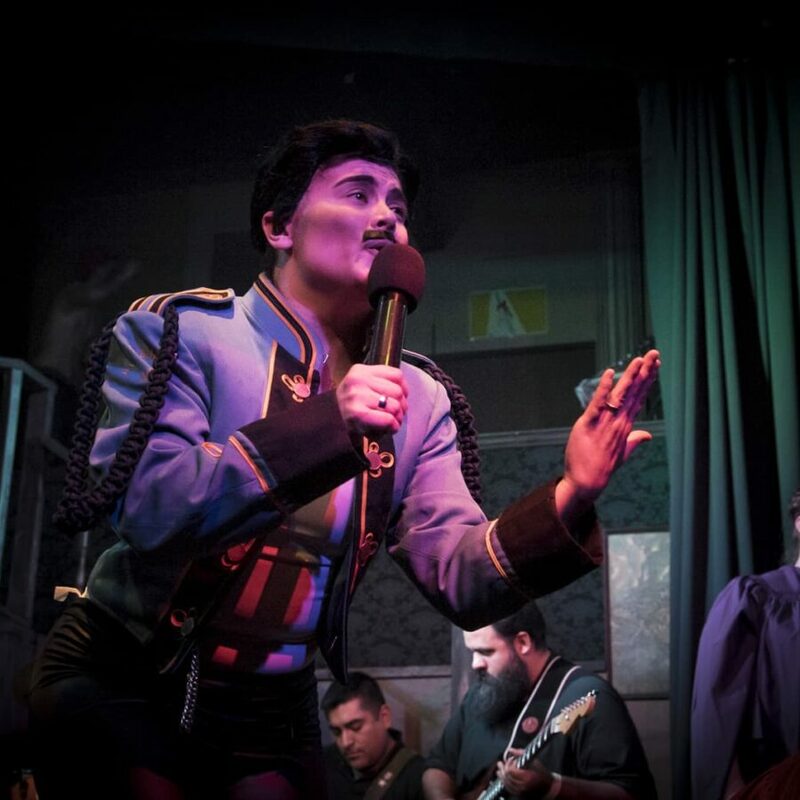 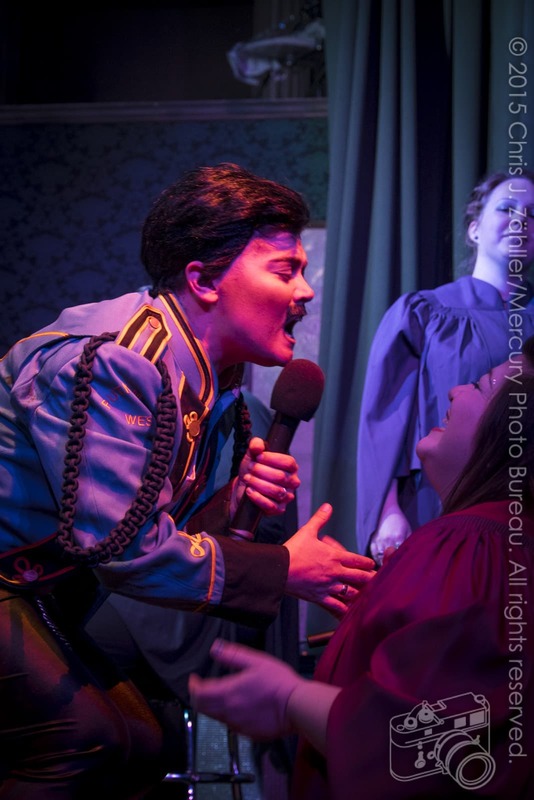 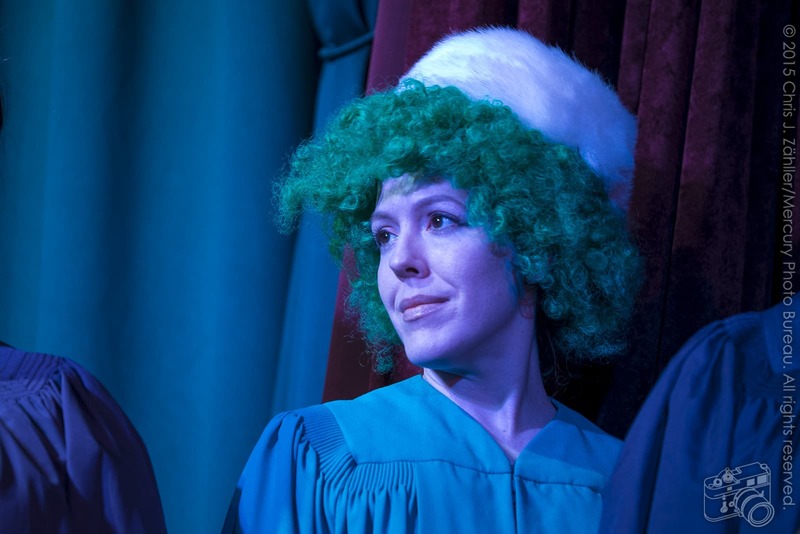 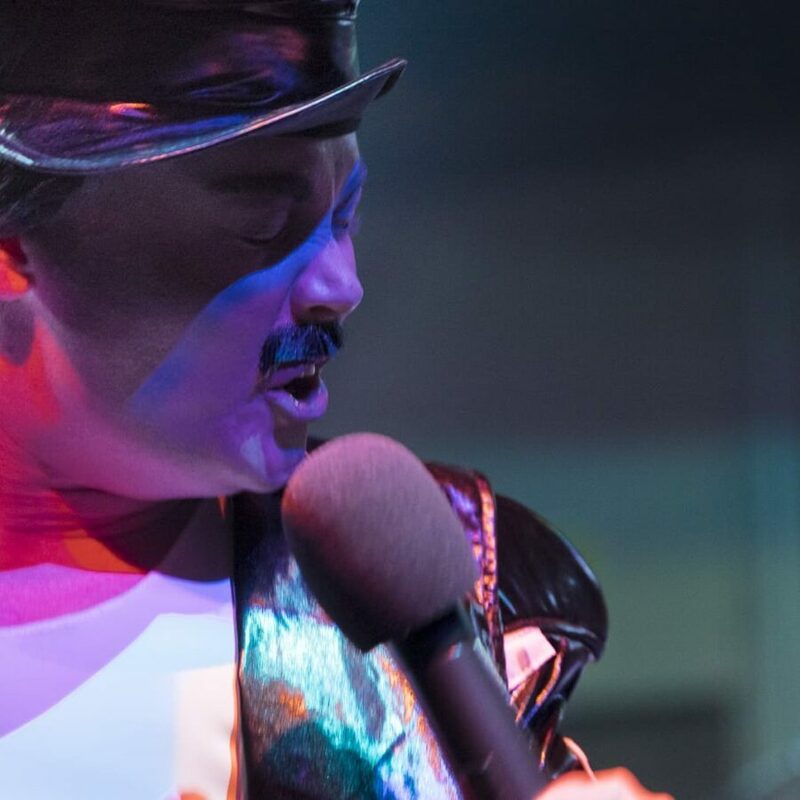 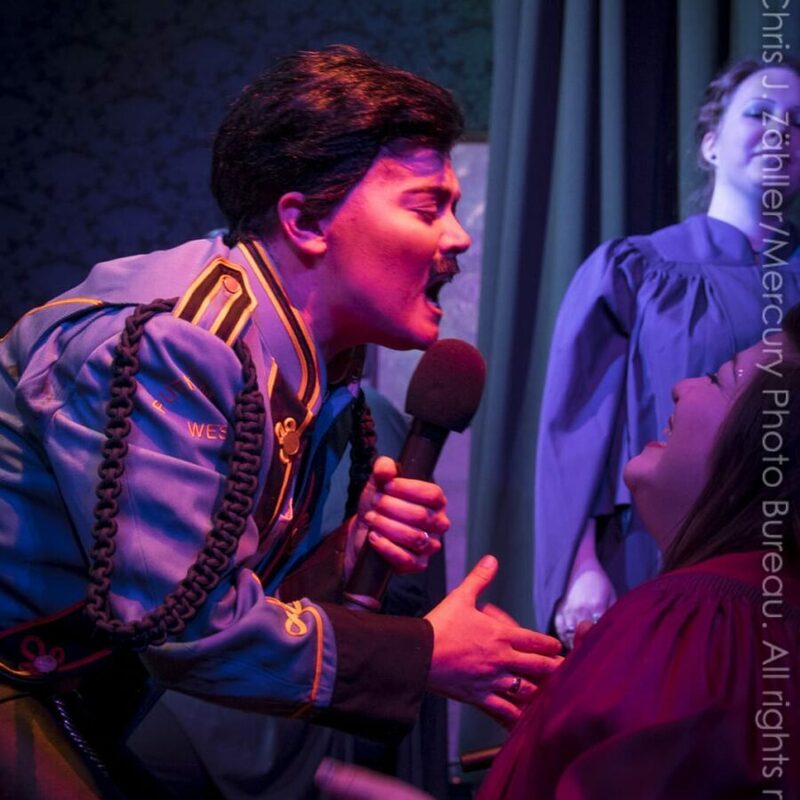 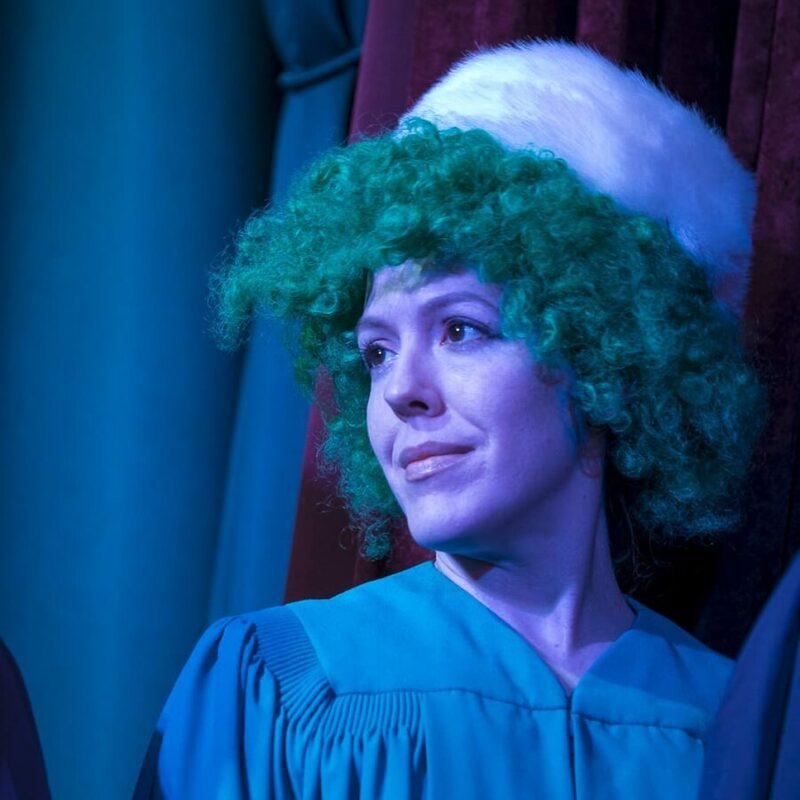 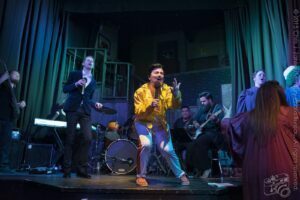 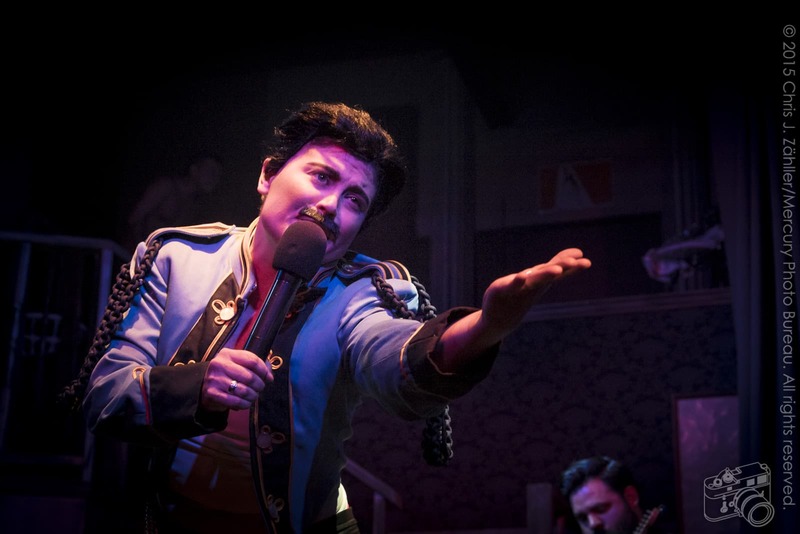 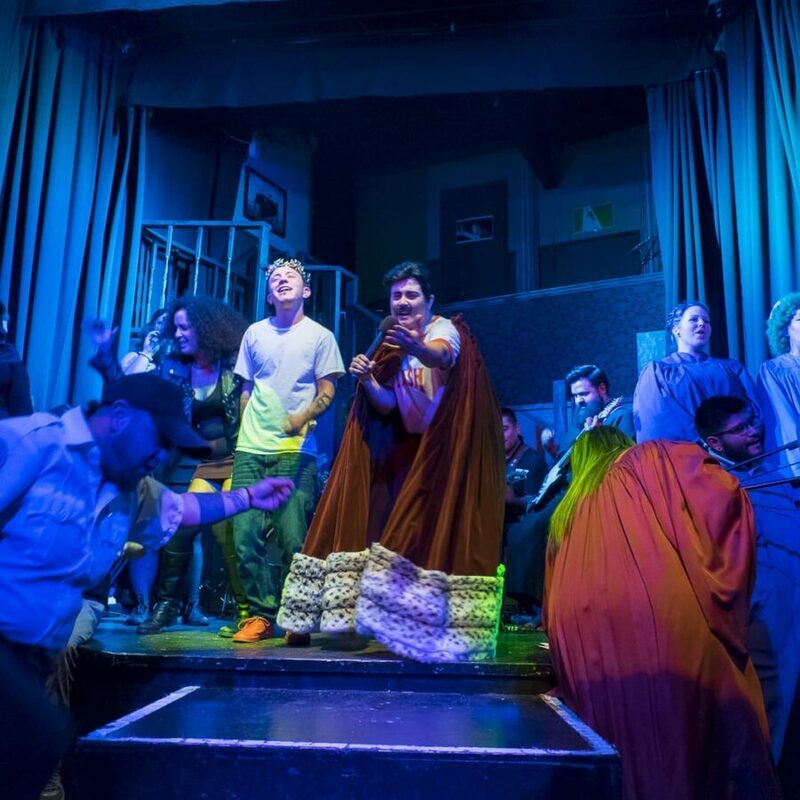 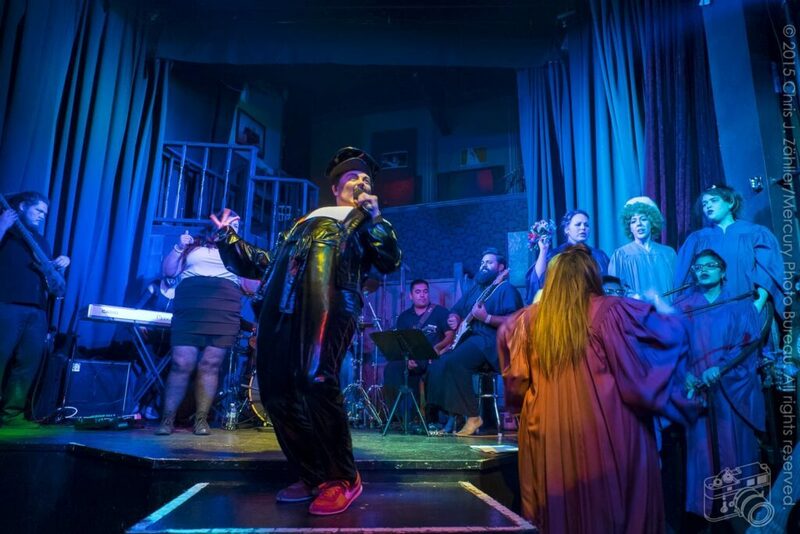 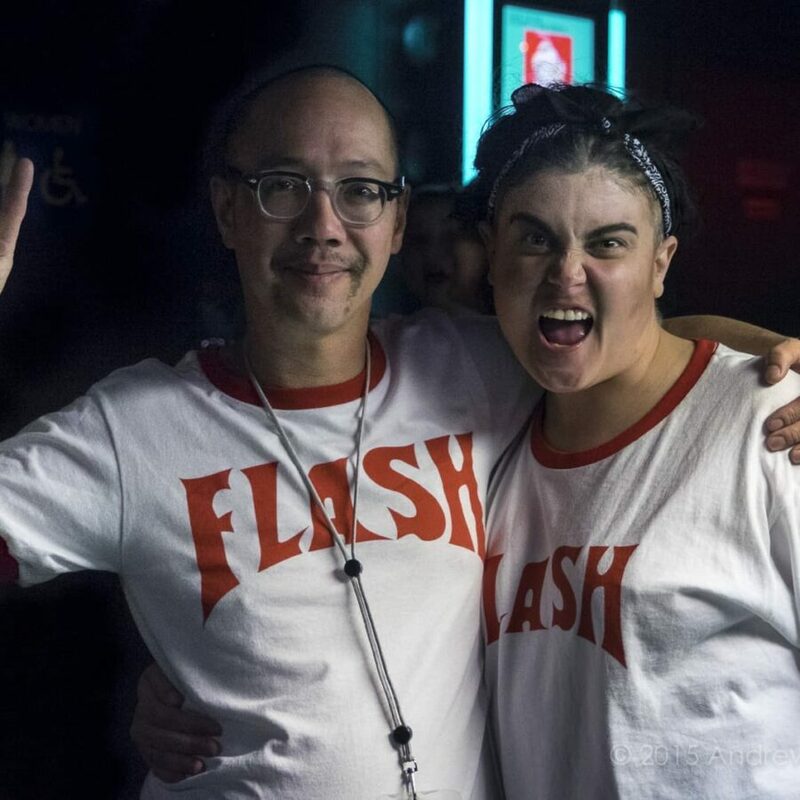 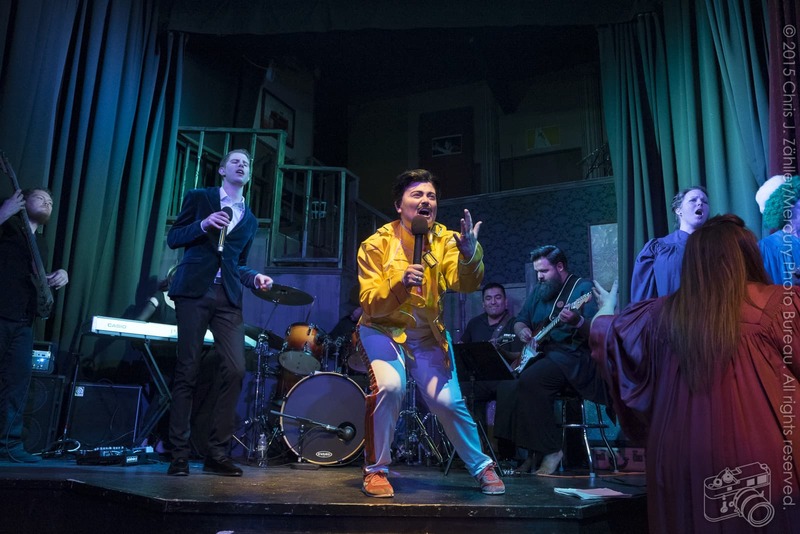 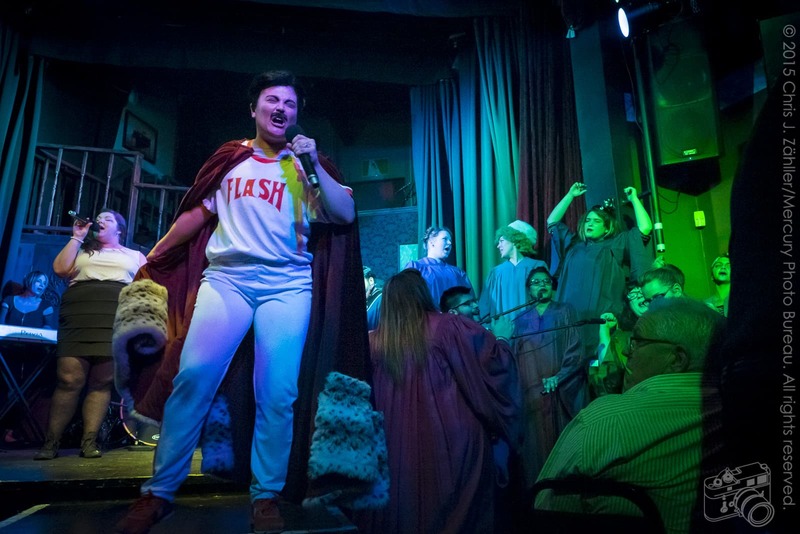 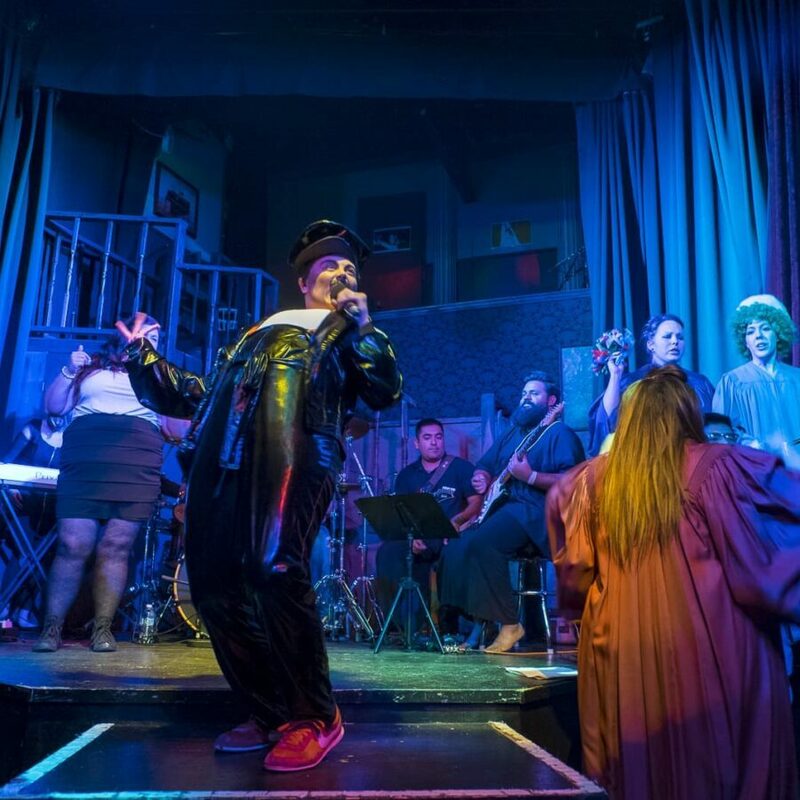 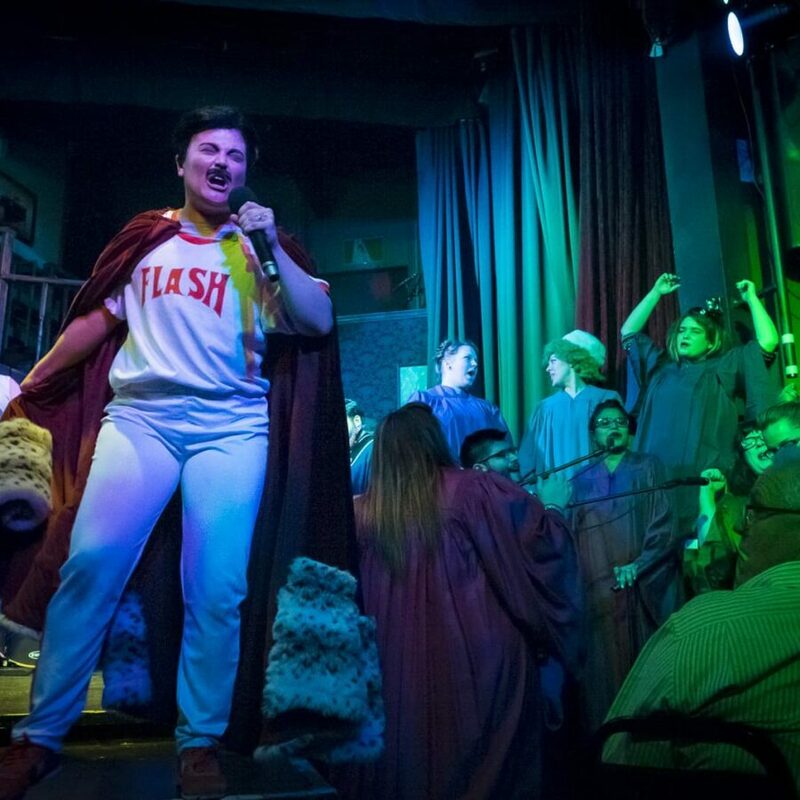 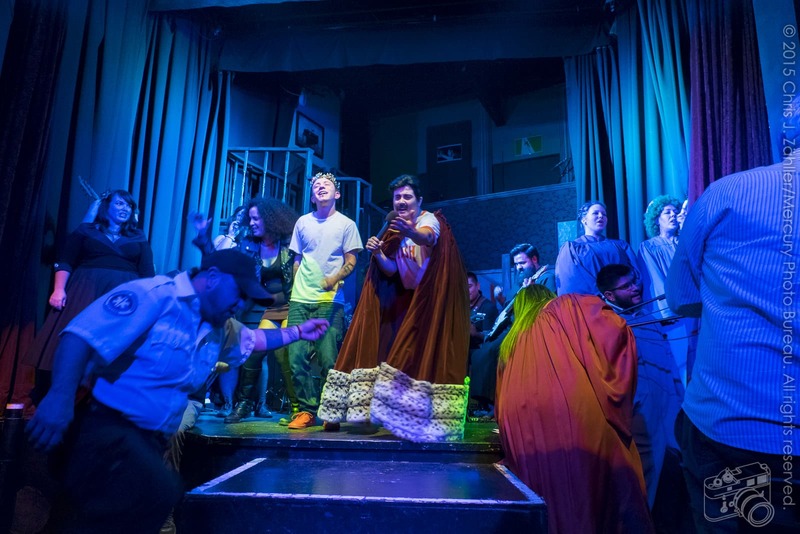 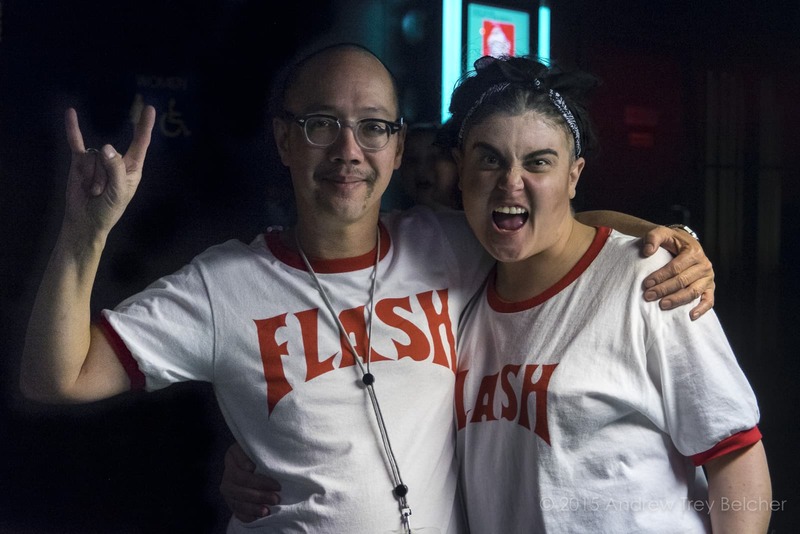 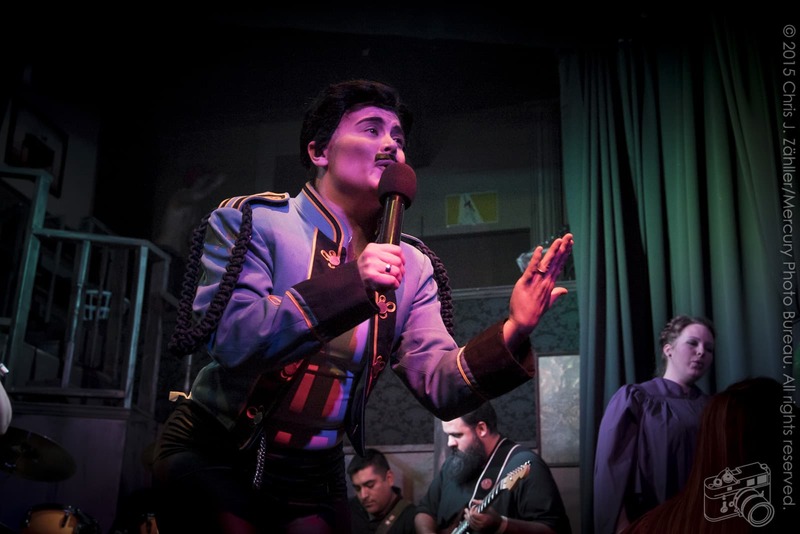 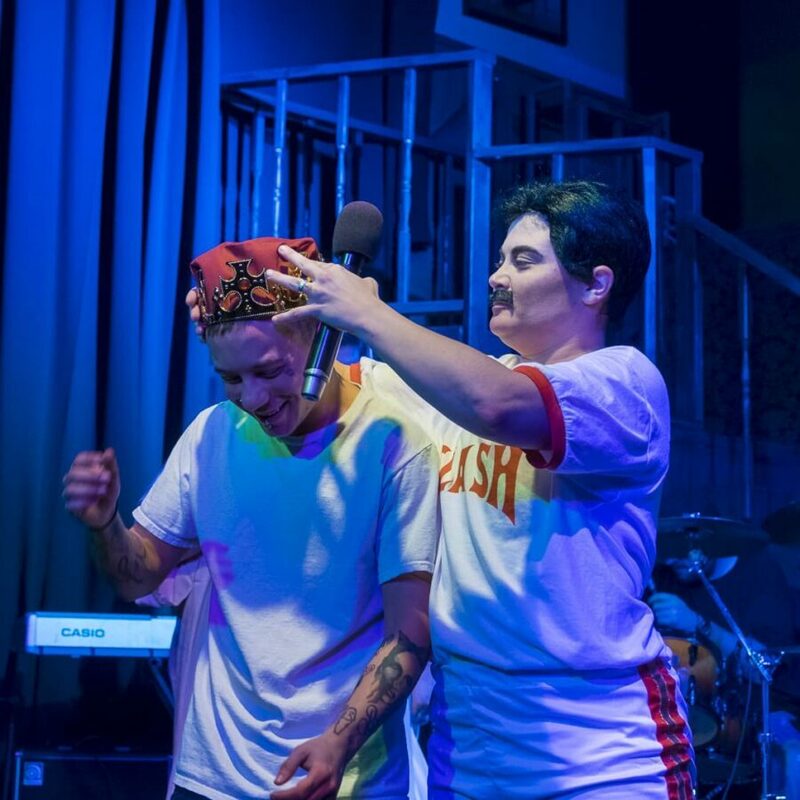 The show fea­tures no dia­logue; instead, Zuniga nar­rates the story while cel­e­brated drag king Max A. Warner and his fel­low actors pan­tomime the action. 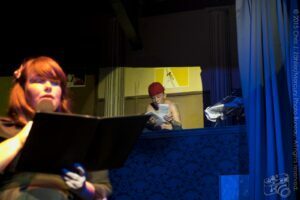 Warner plays Heather, a.k.a. 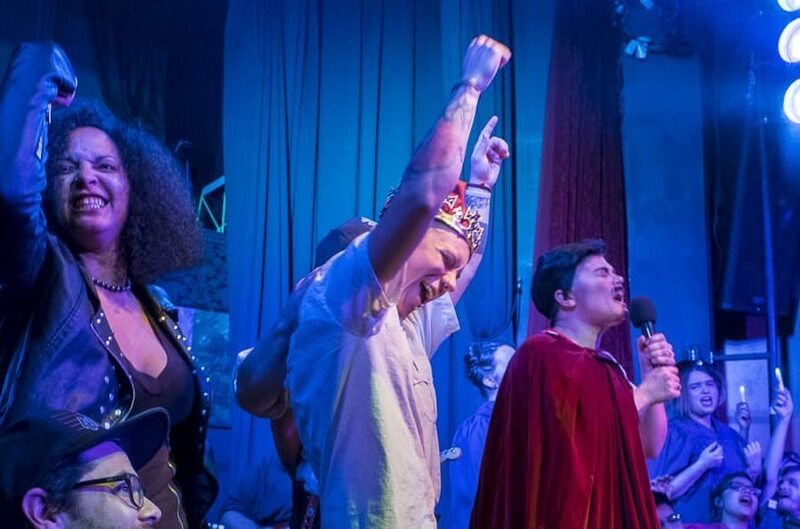 The King, a young per­son tran­si­tion­ing from woman to trans man and find­ing rejec­tion and heartache along the way. All the while, his guardian angel Mercury watches over him. 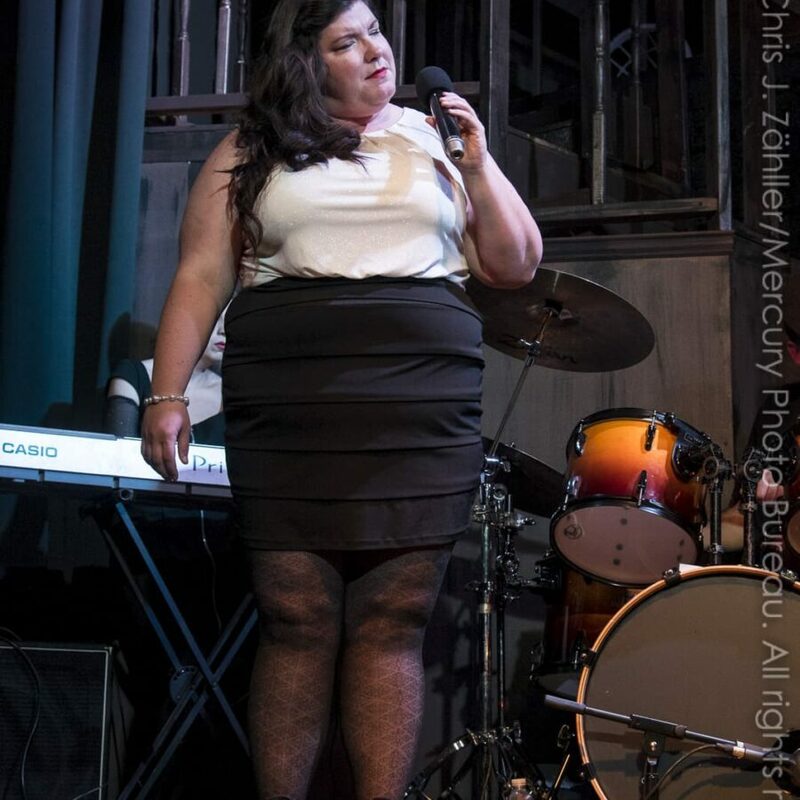 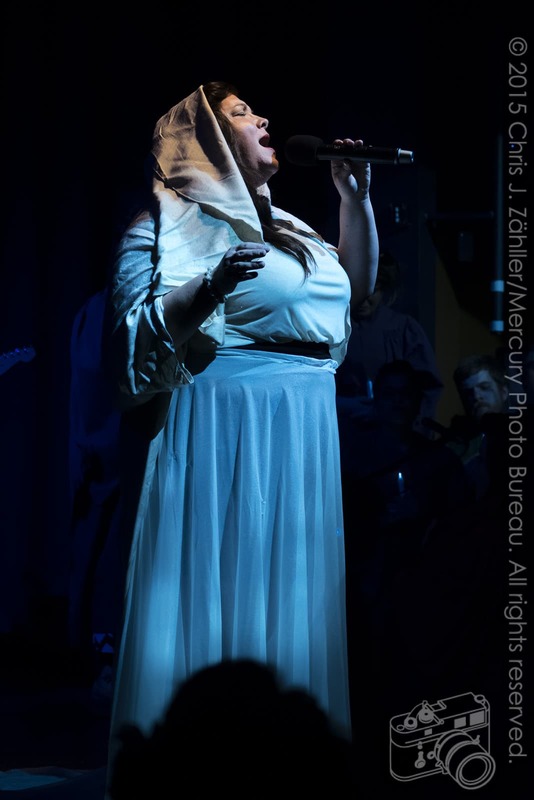 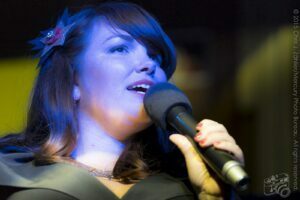 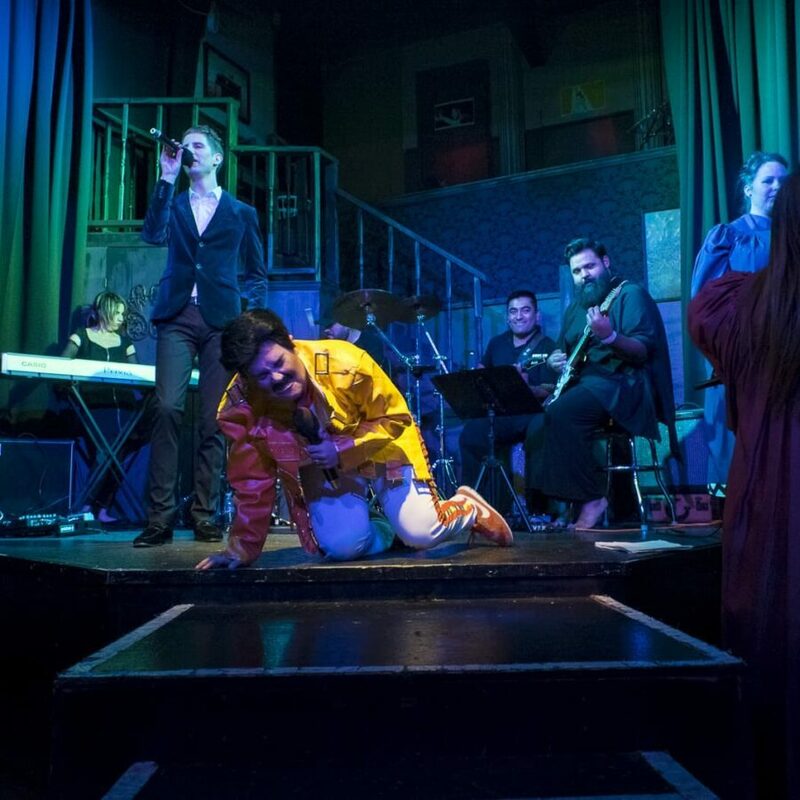 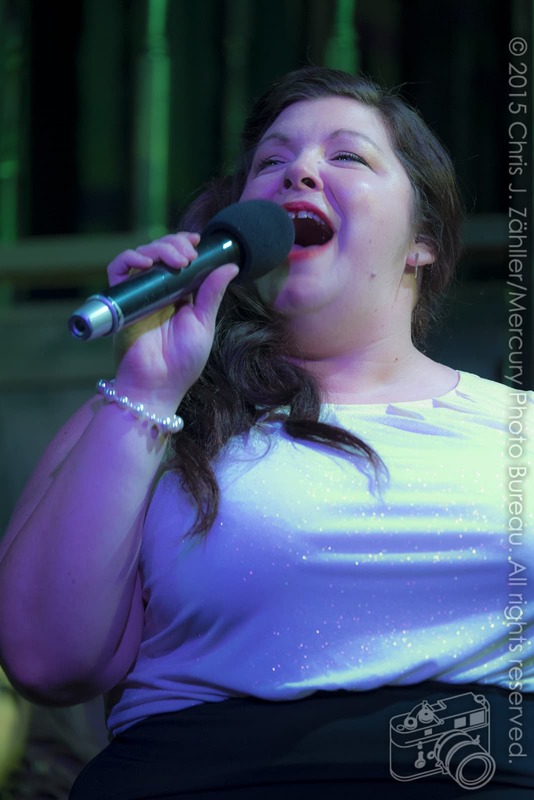 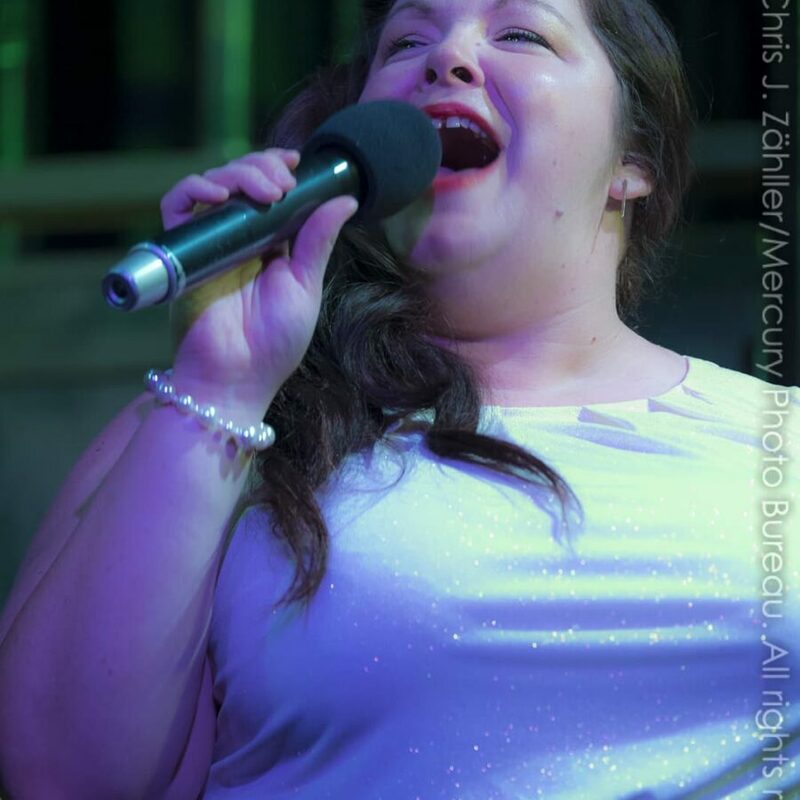 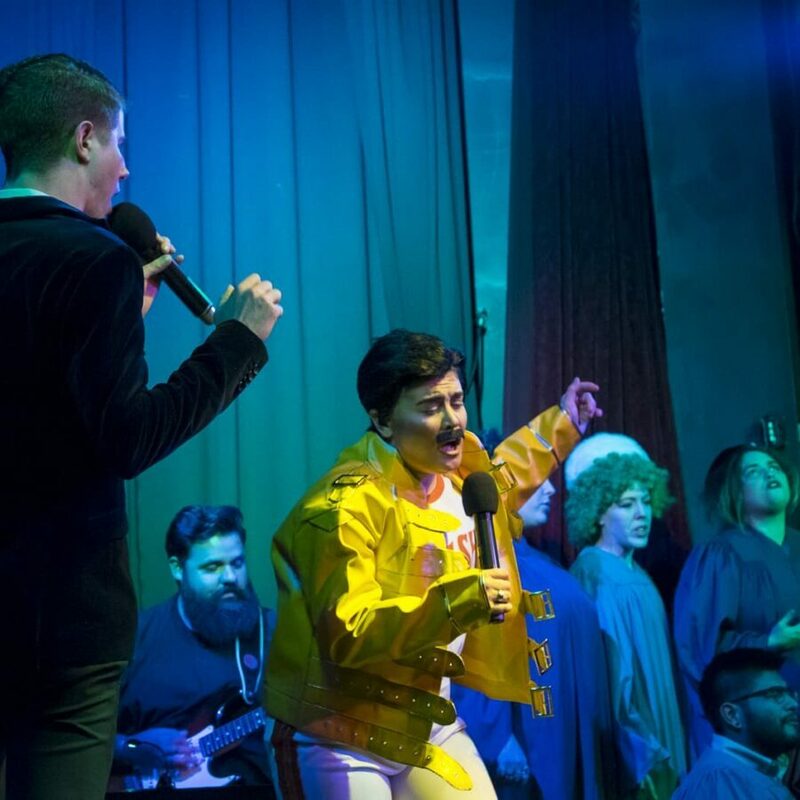 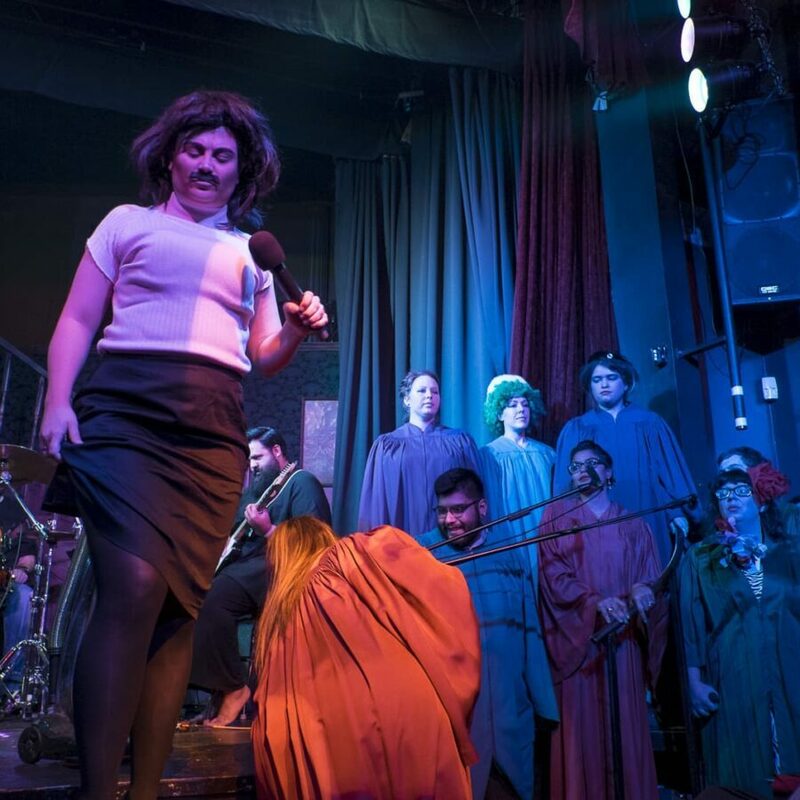 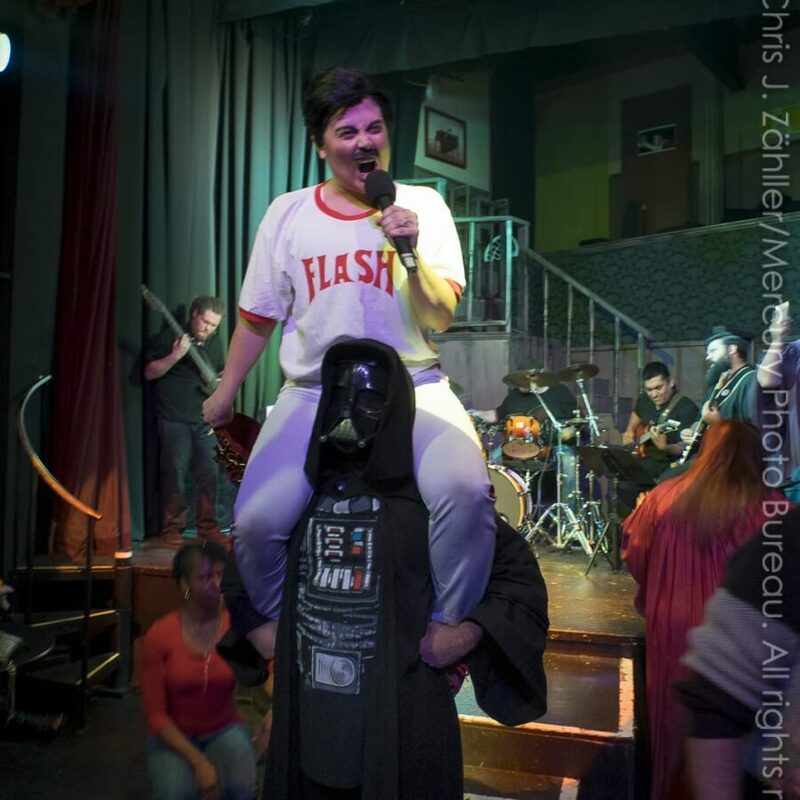 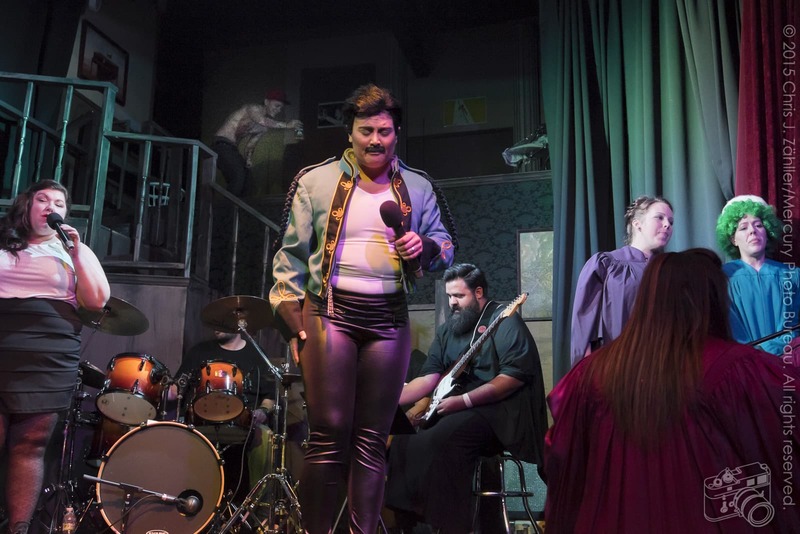 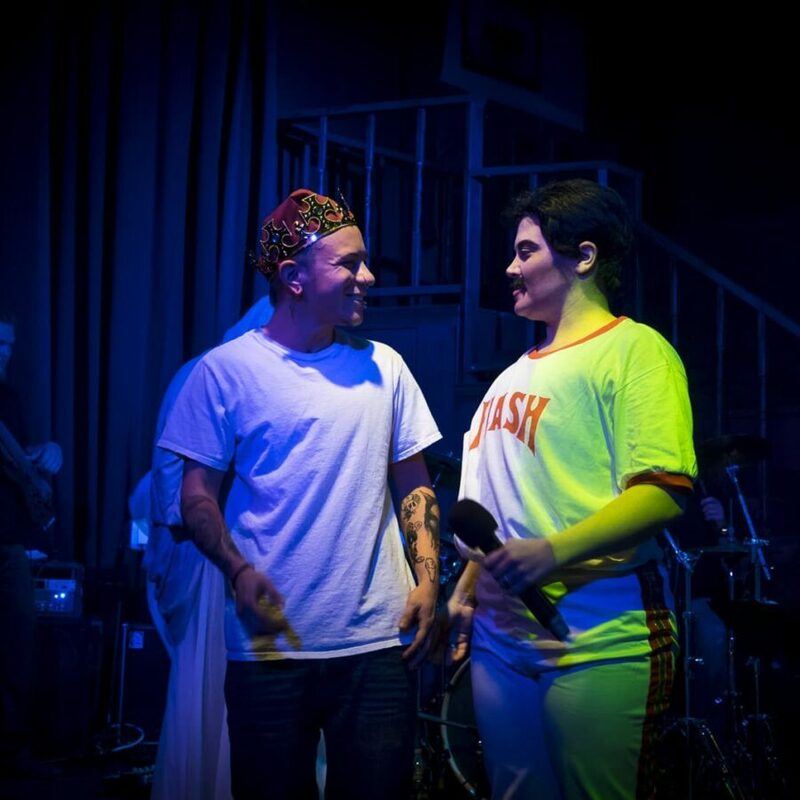 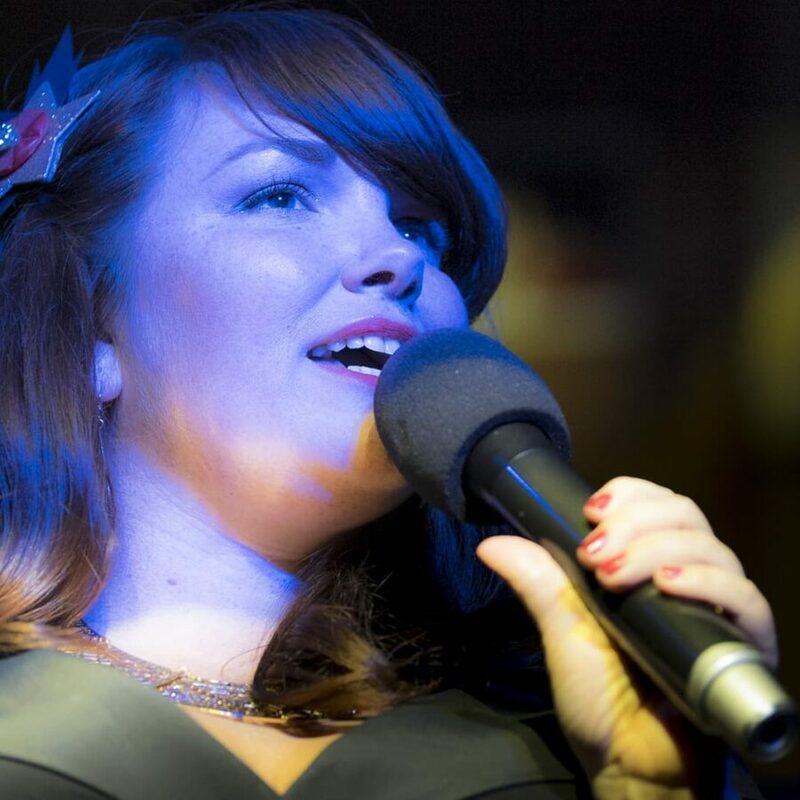 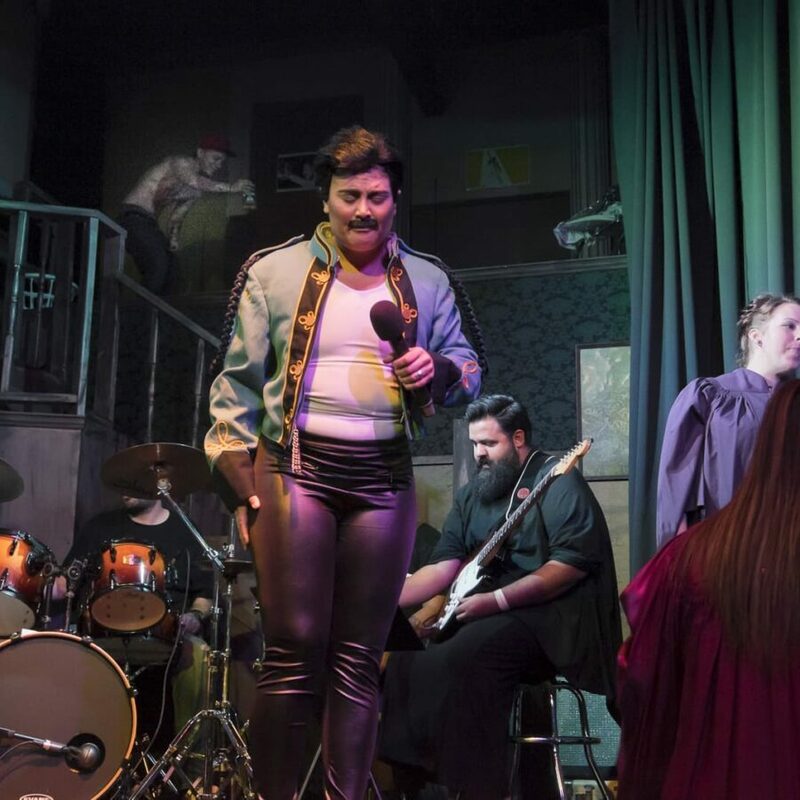 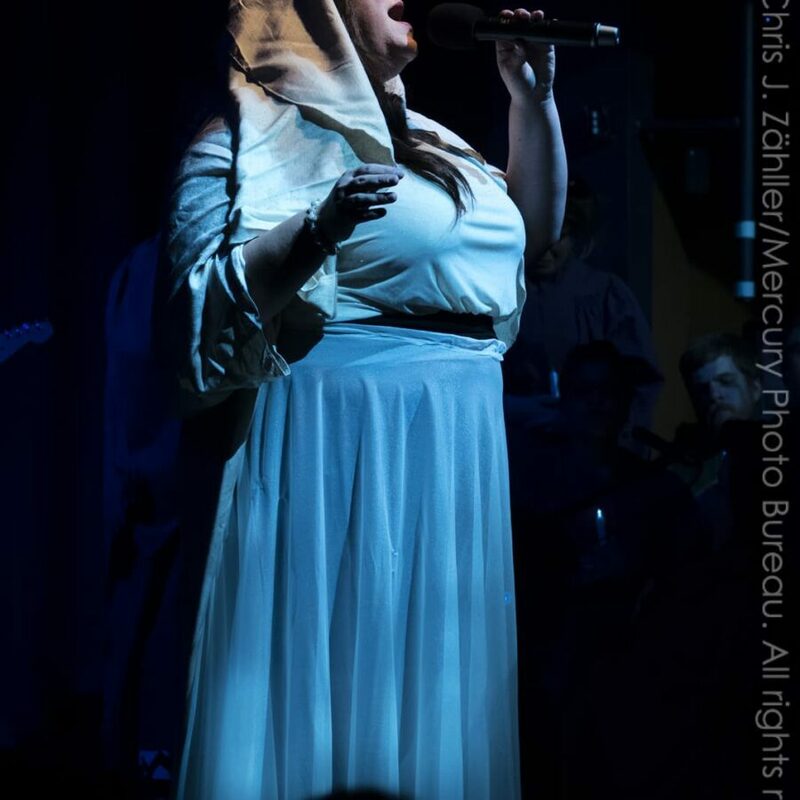 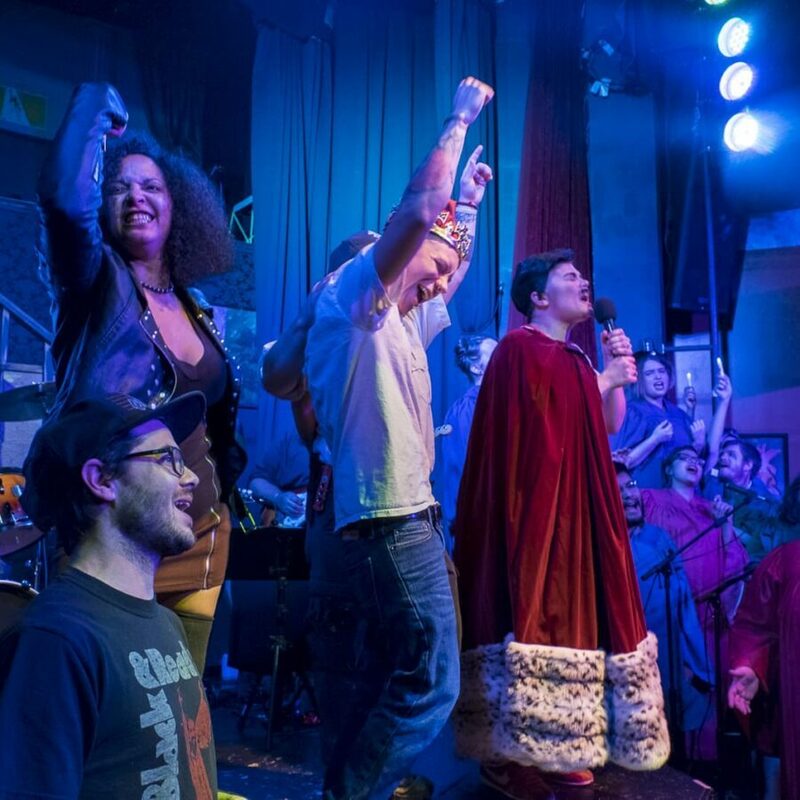 LaRissa Conn sings the back­ing vocals, while Jacob Abello appears in a cameo as David Bowie. 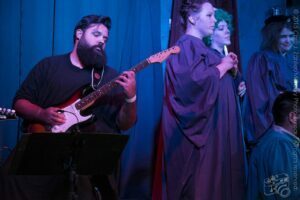 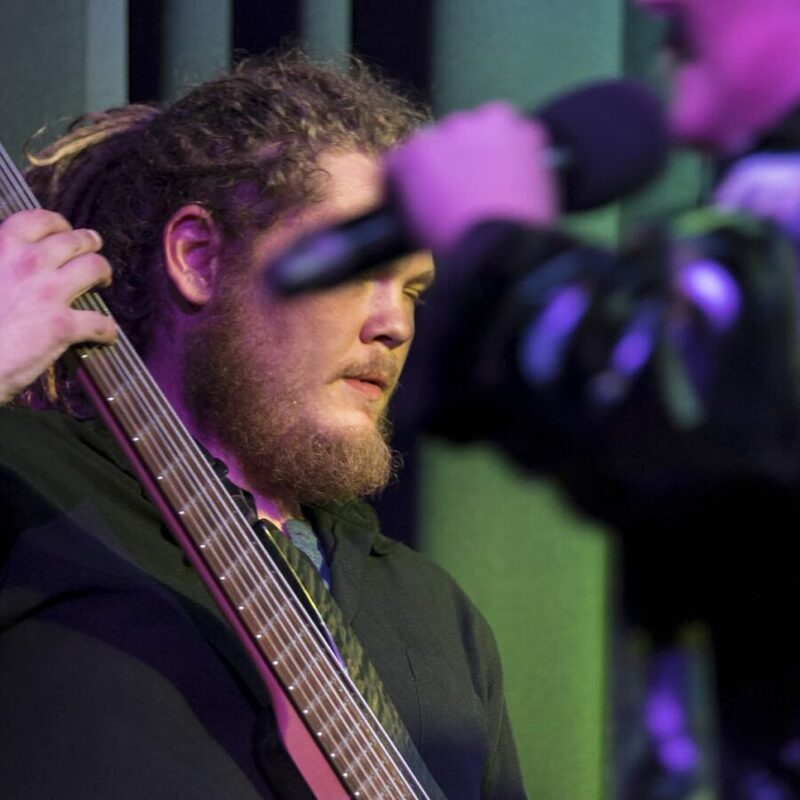 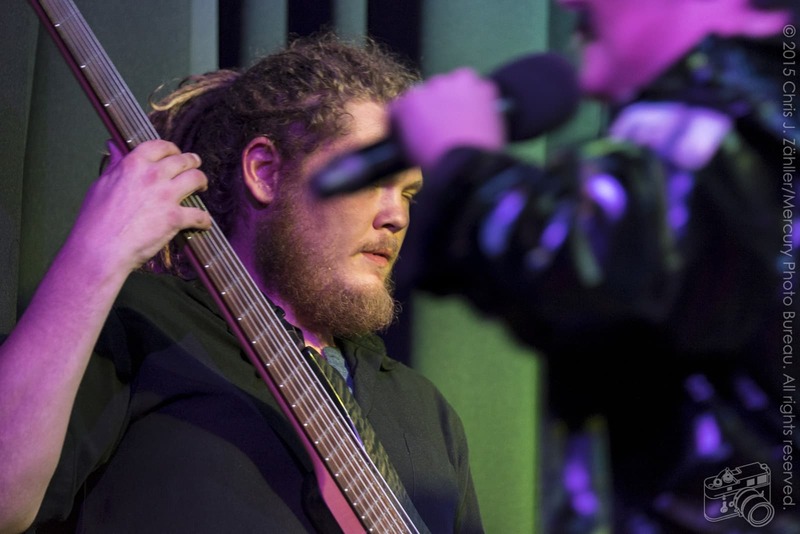 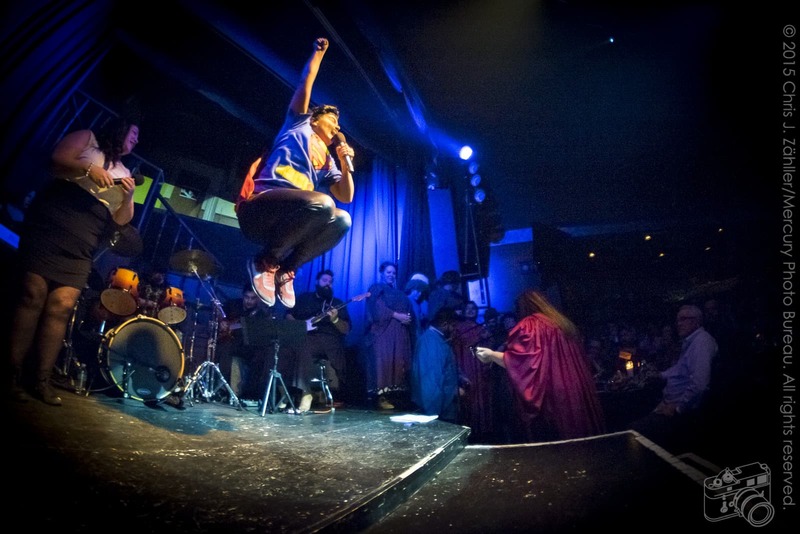 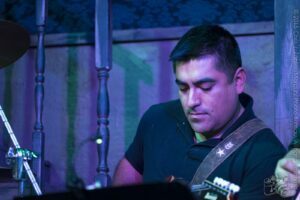 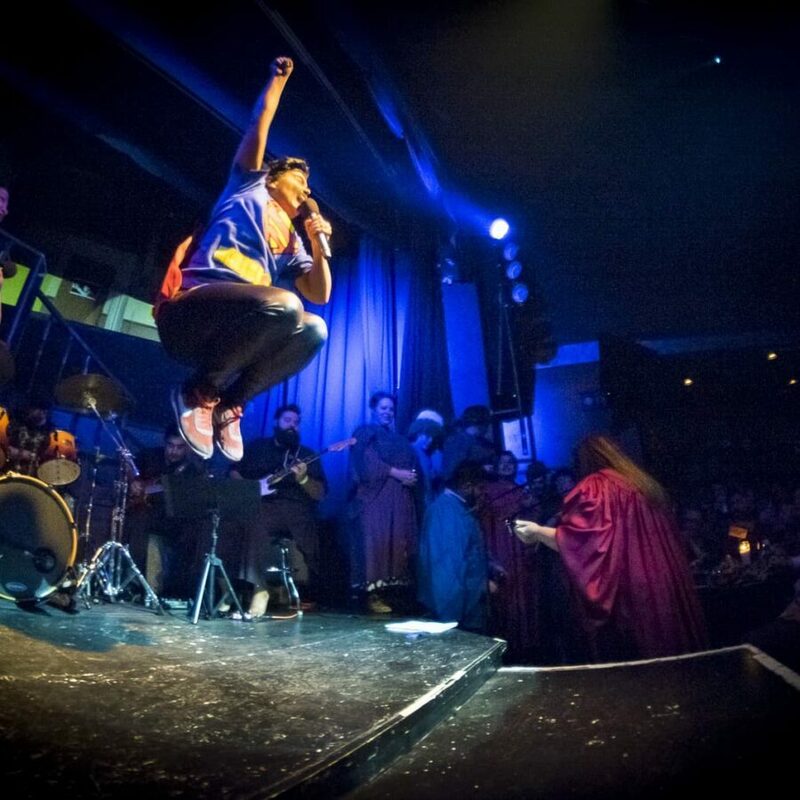 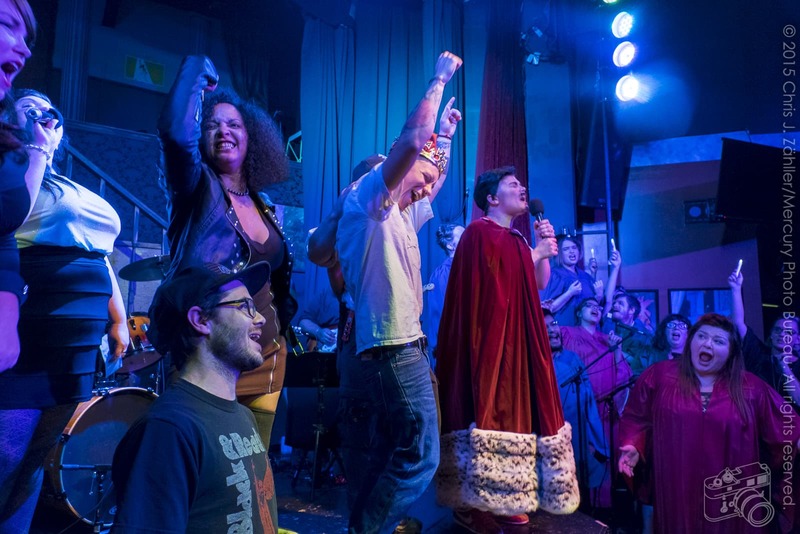 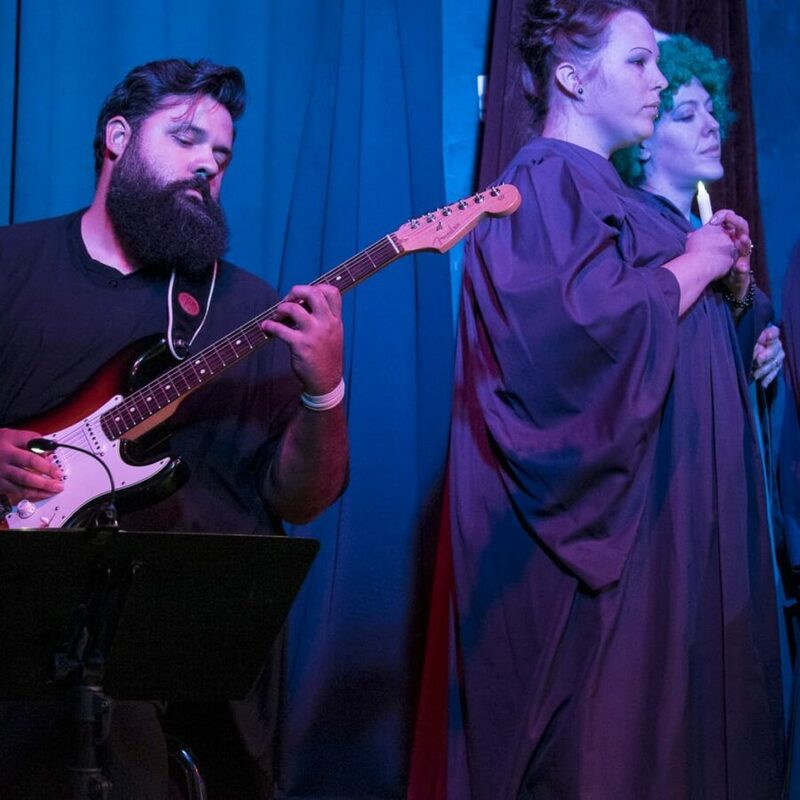 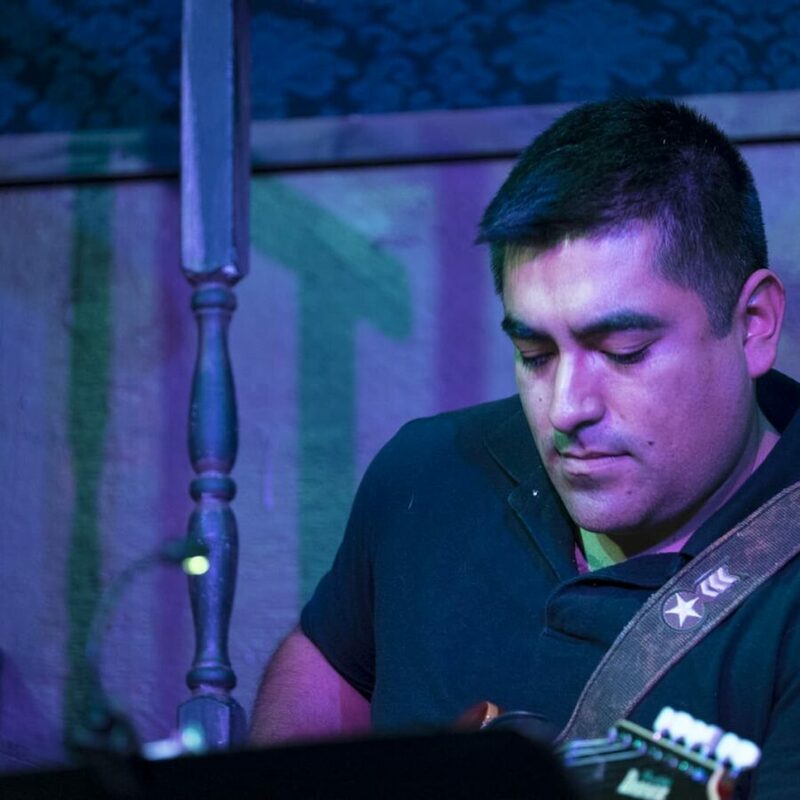 The Royal Court band con­sists of Bear Rodriguez and Hector Lopez, gui­tars, Eric Harris, bass, Holly Moorad, key­board, and Jacob Becannen, drums and musi­cal direc­tion. 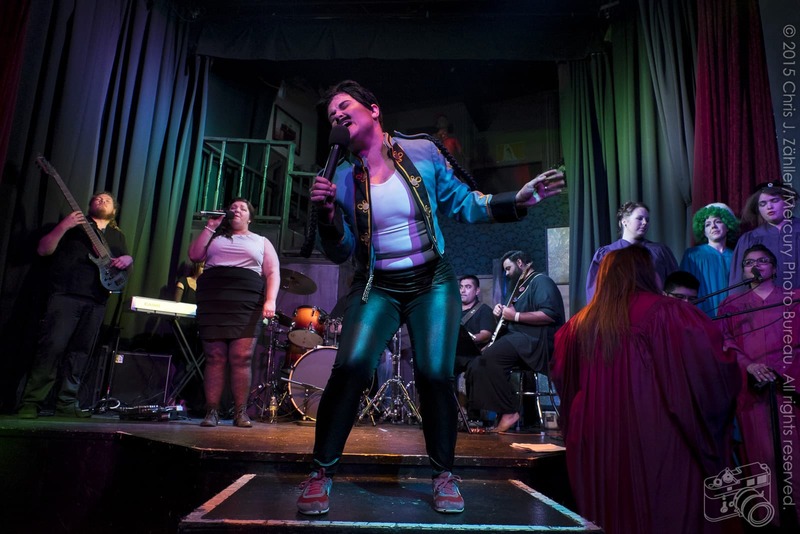 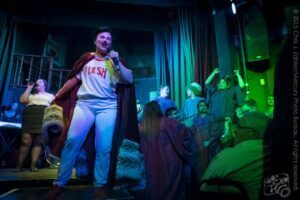 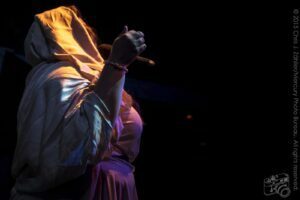 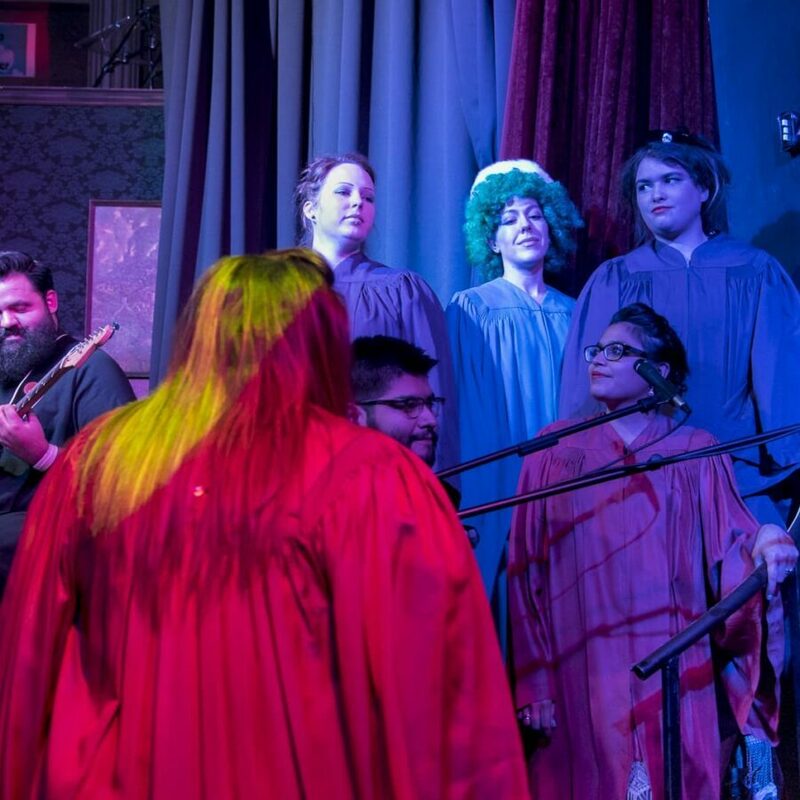 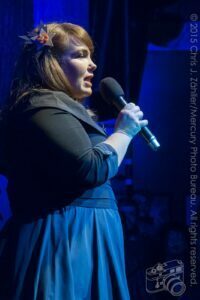 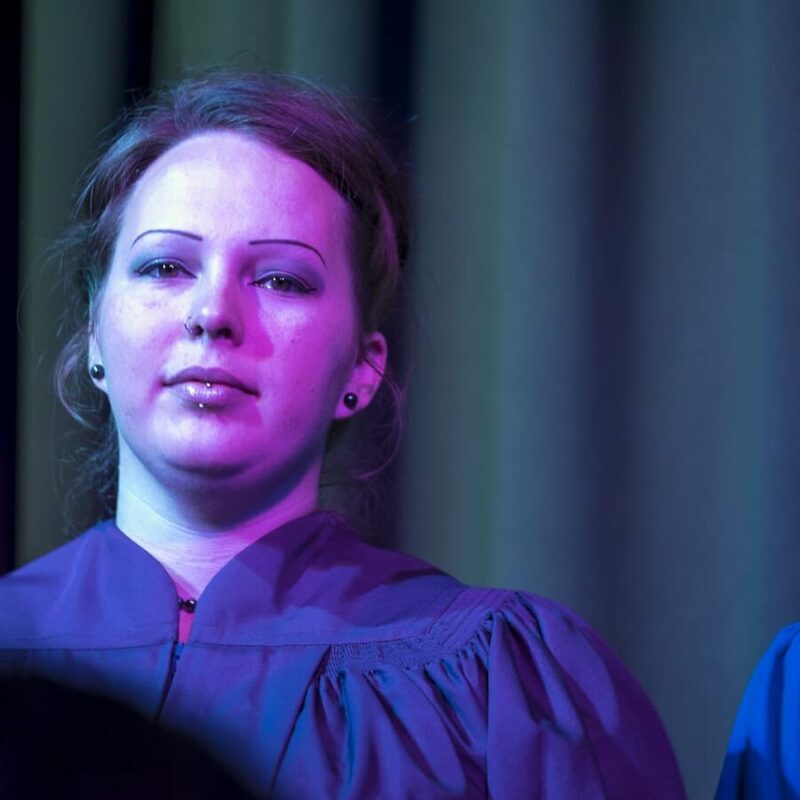 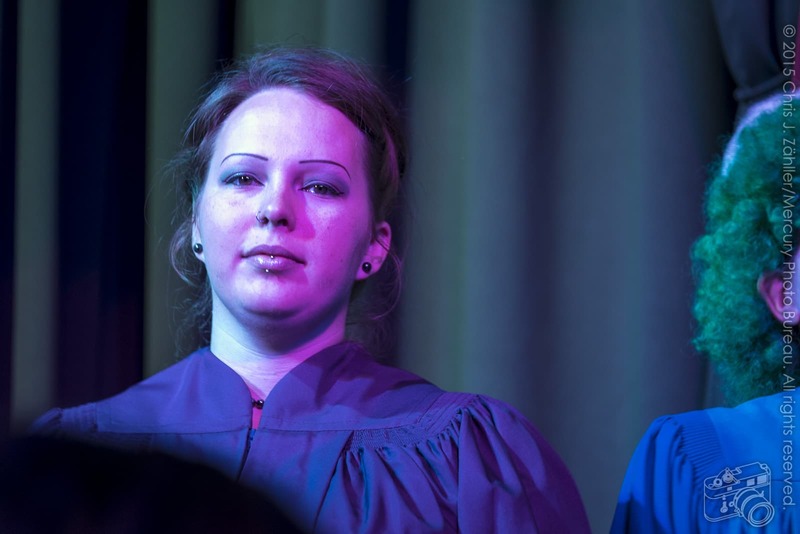 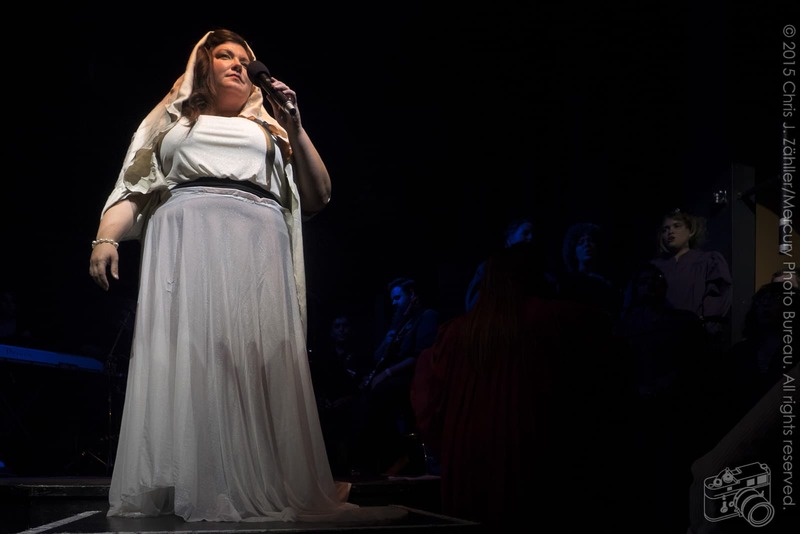 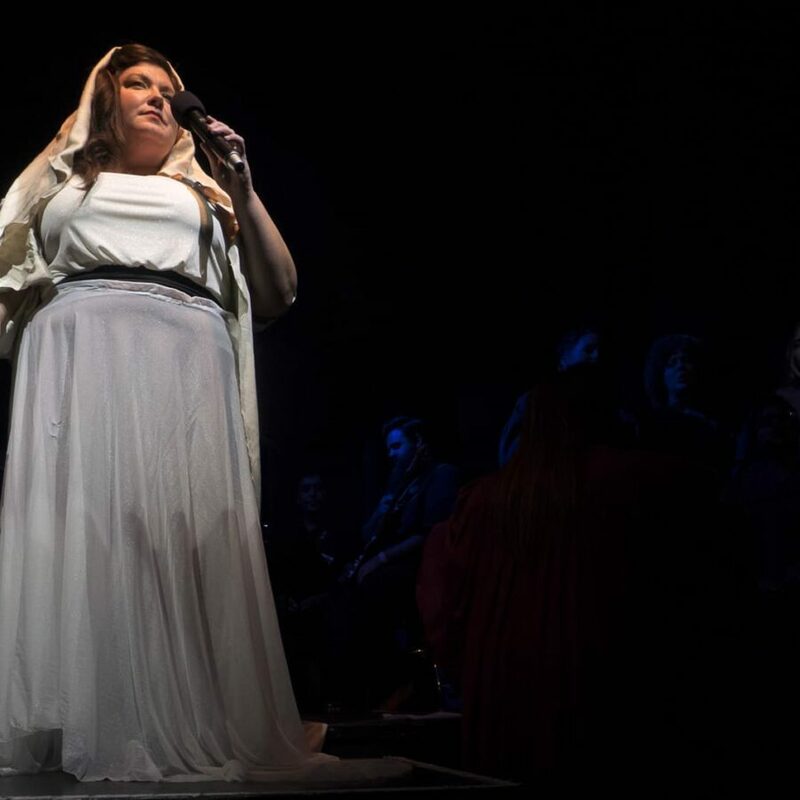 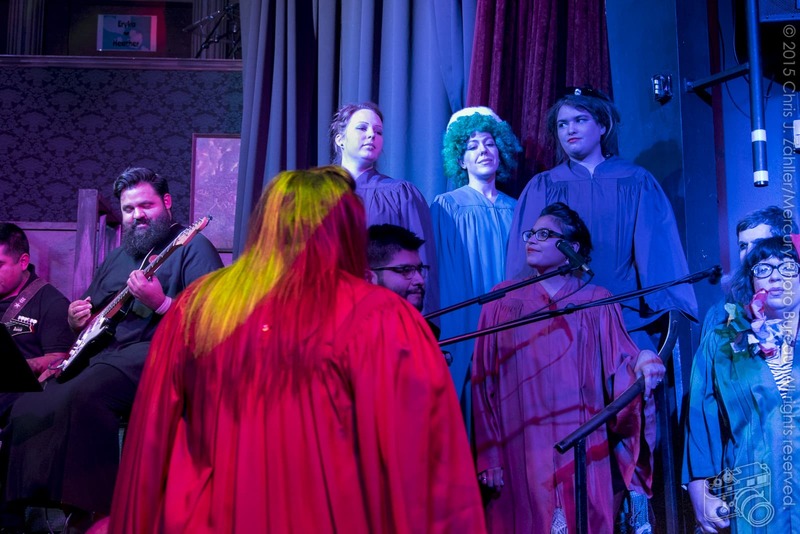 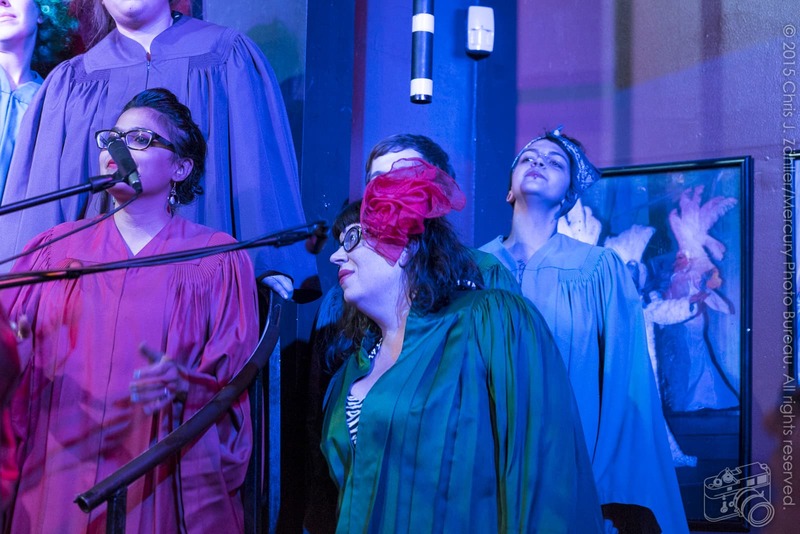 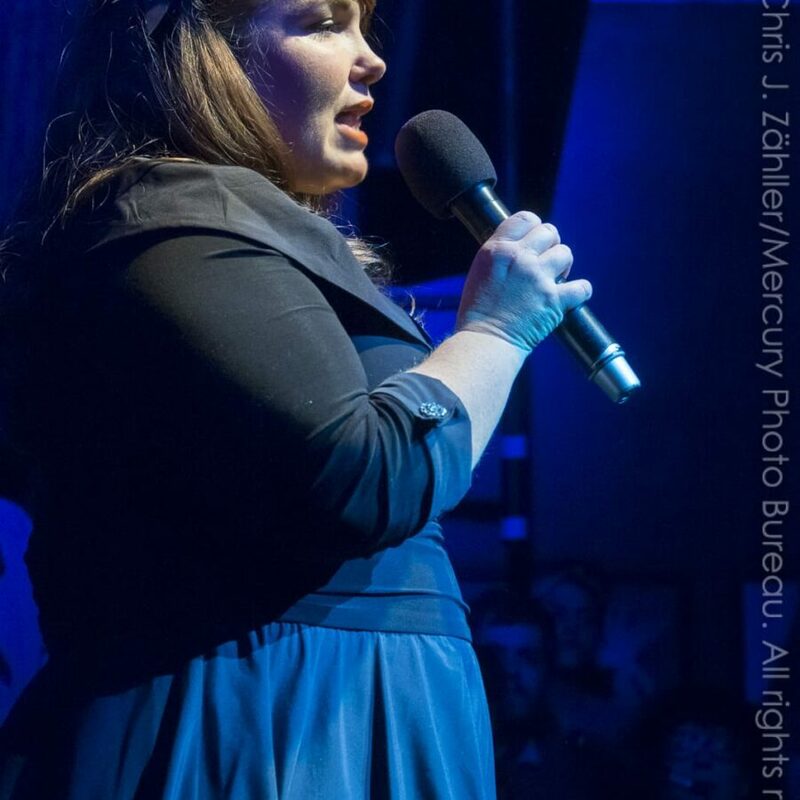 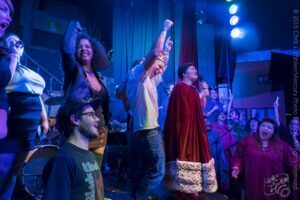 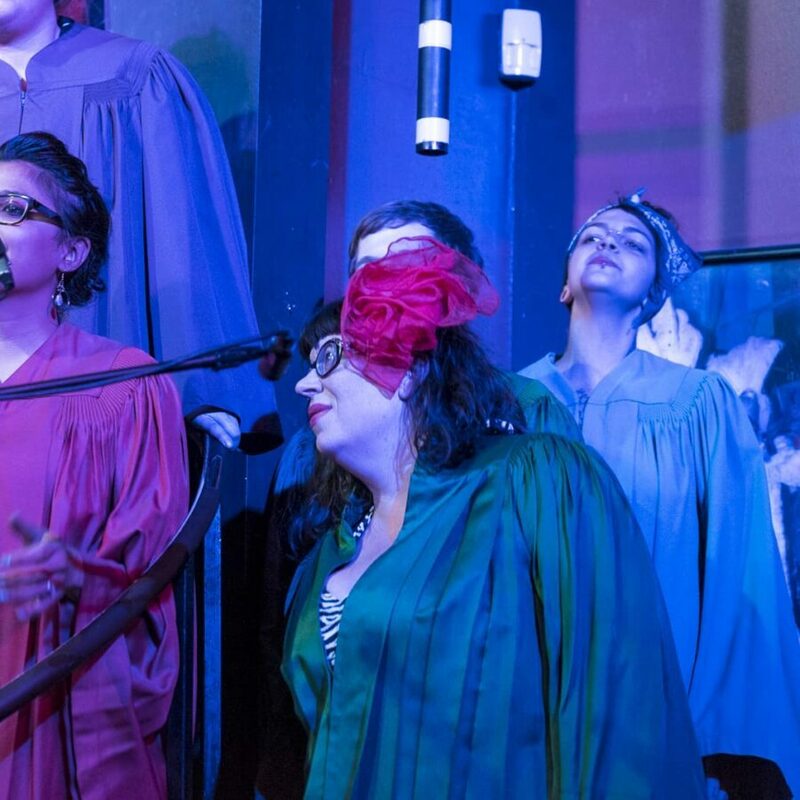 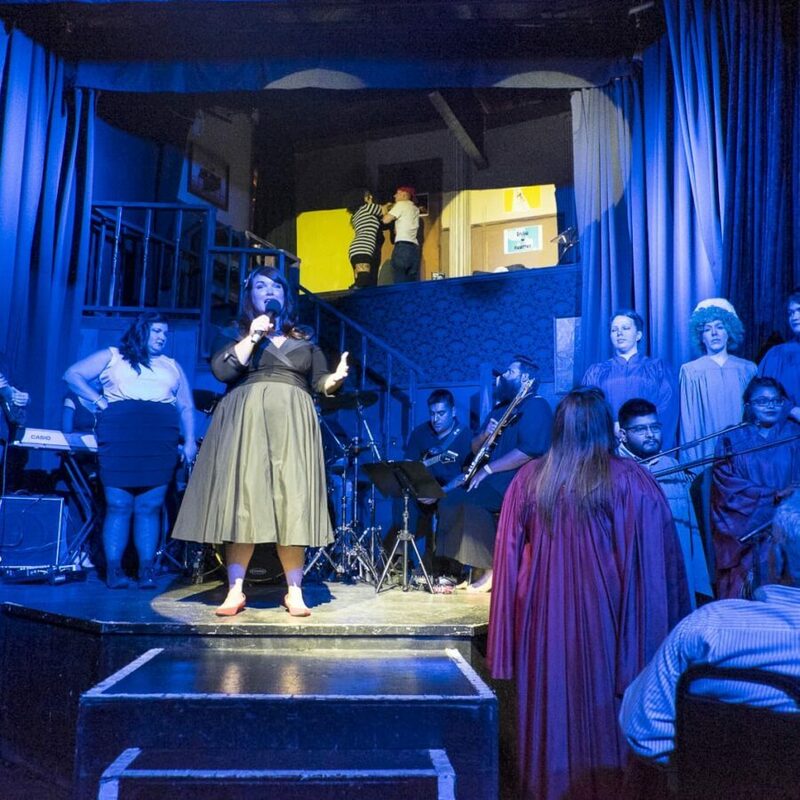 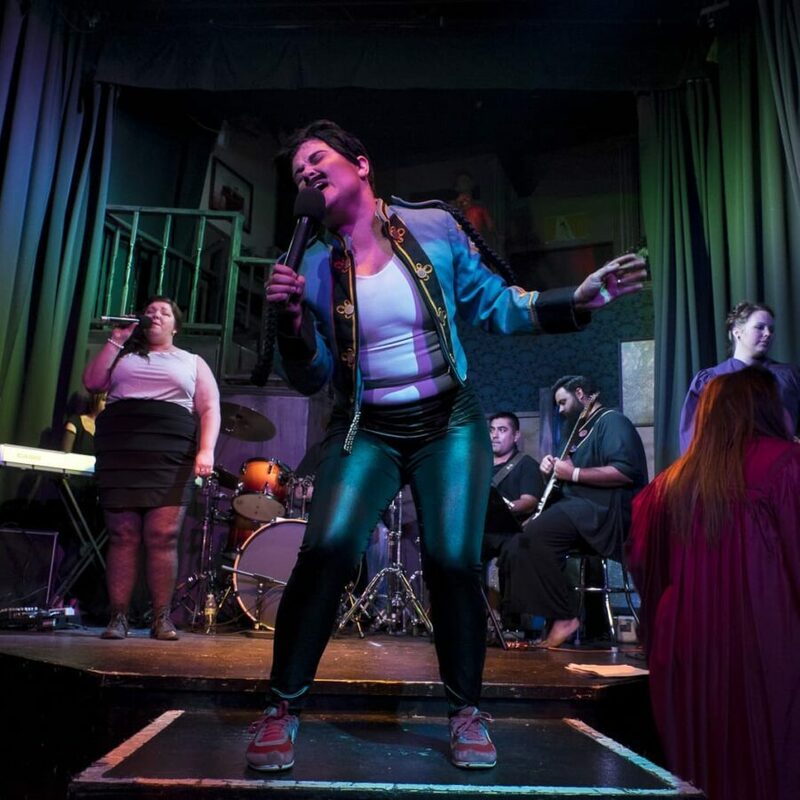 Crystal Huffman directs the Voices of Love and Fury Choir, con­sist­ing of Summer Blossom, Sarah Chambers, Holly Pierce, Elecktra Stanislava, Talia Talibbudin, BC Summers, Garrett Young, and Aaron Valles.